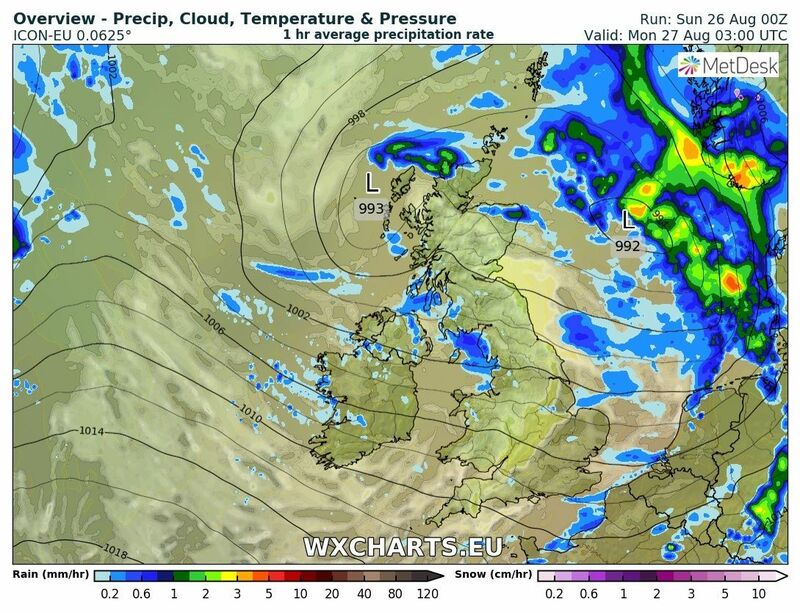 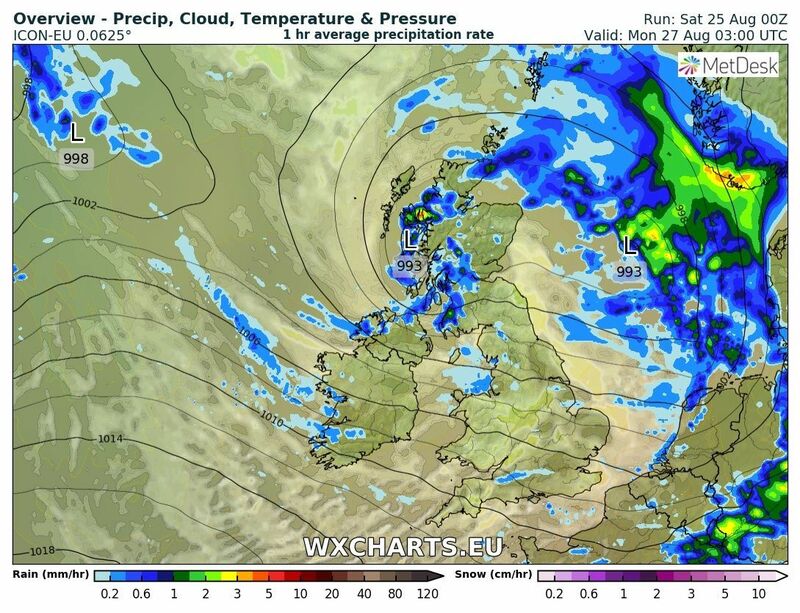 This portends a very cool and showery day for all of the UK now that the fronts are clear to the south. 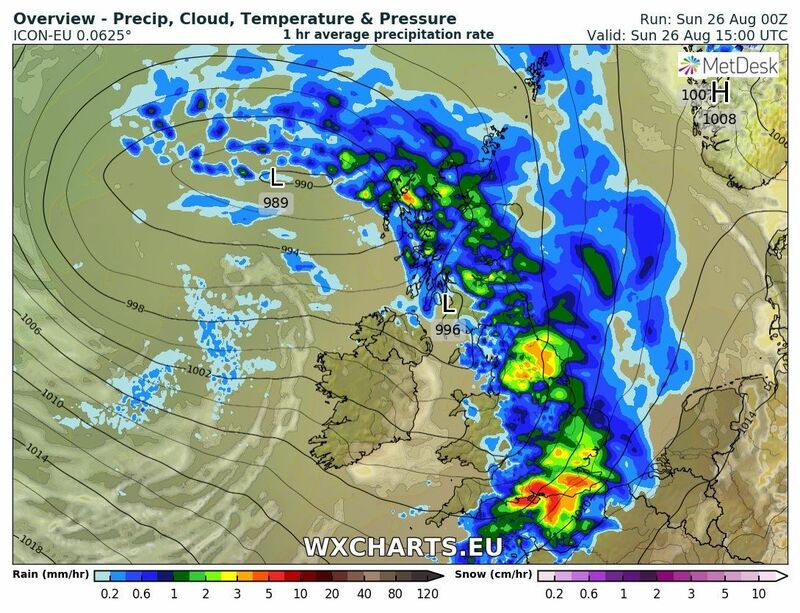 The showers will often be heavy with hail and thunder in the mix and initially far more frequent in the north west but spreading south (and inland) during the day so by evening the heavy concentration will be in the south west and south. 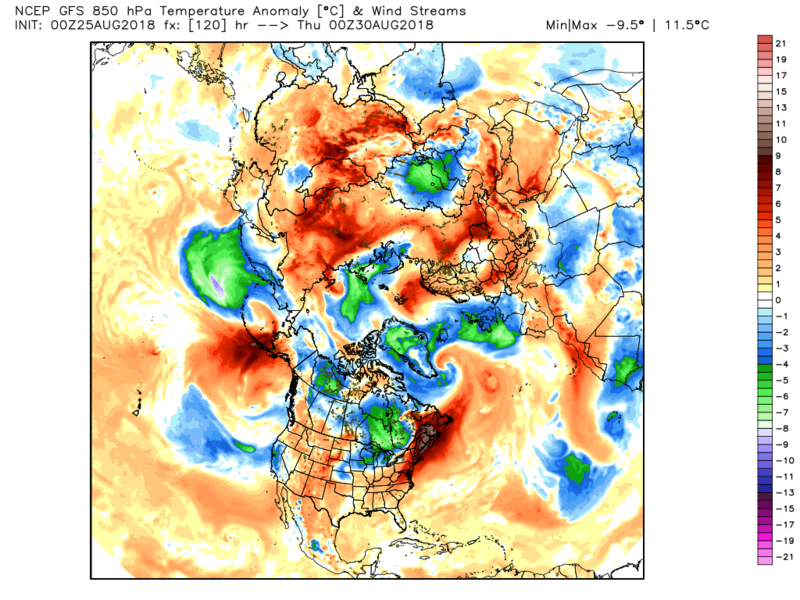 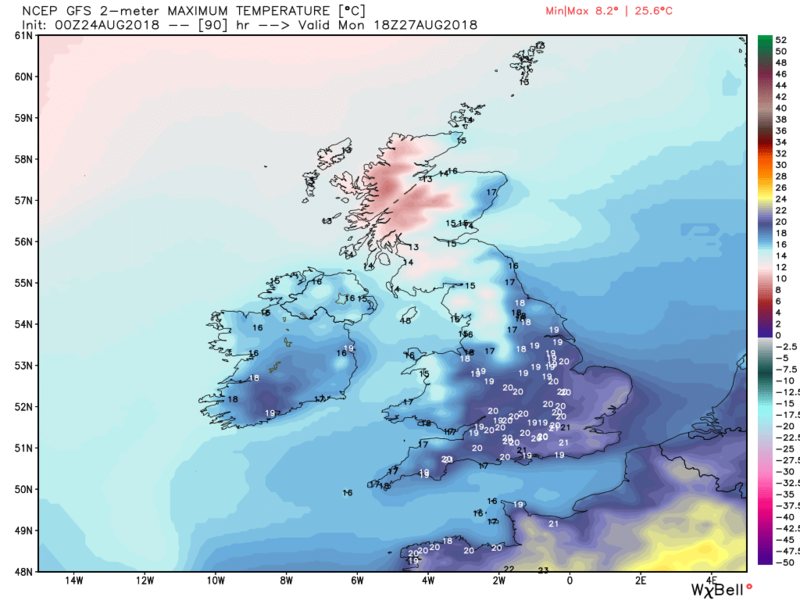 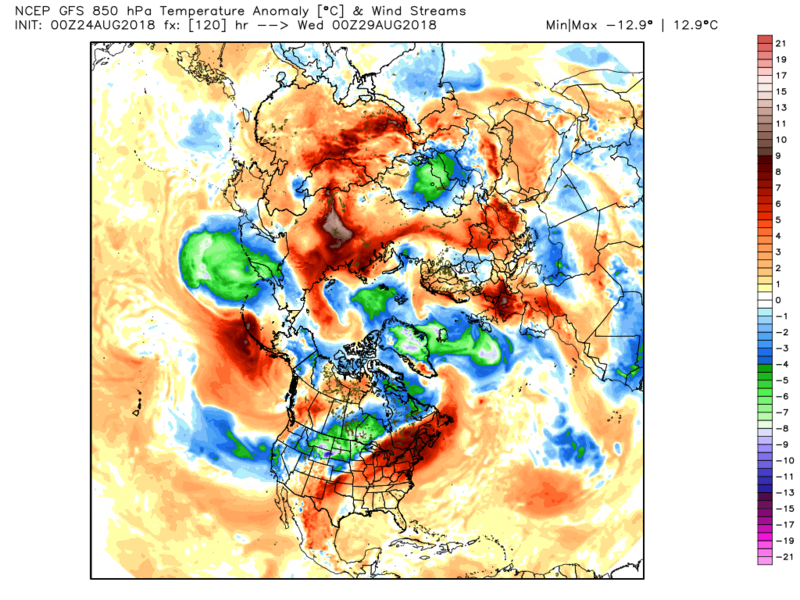 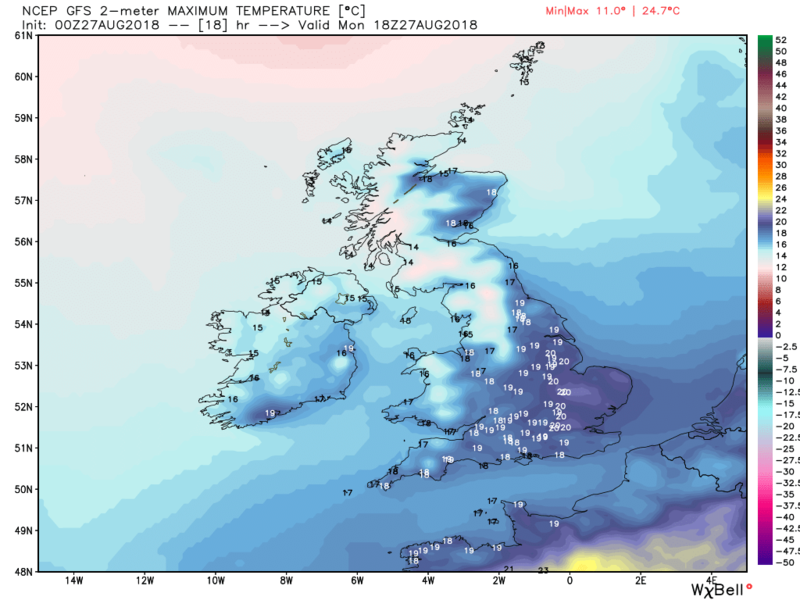 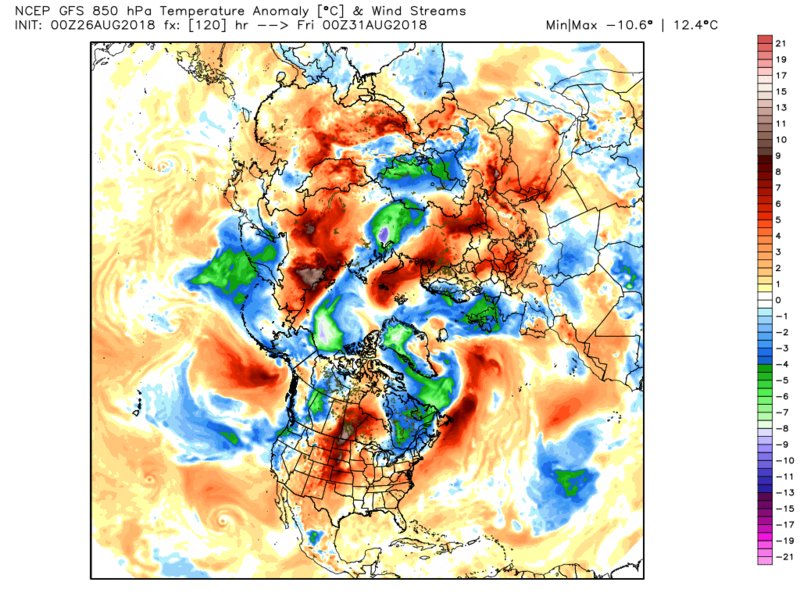 In comparison with recent temperatures it will feel quite cool with temps below average, significantly so in places. 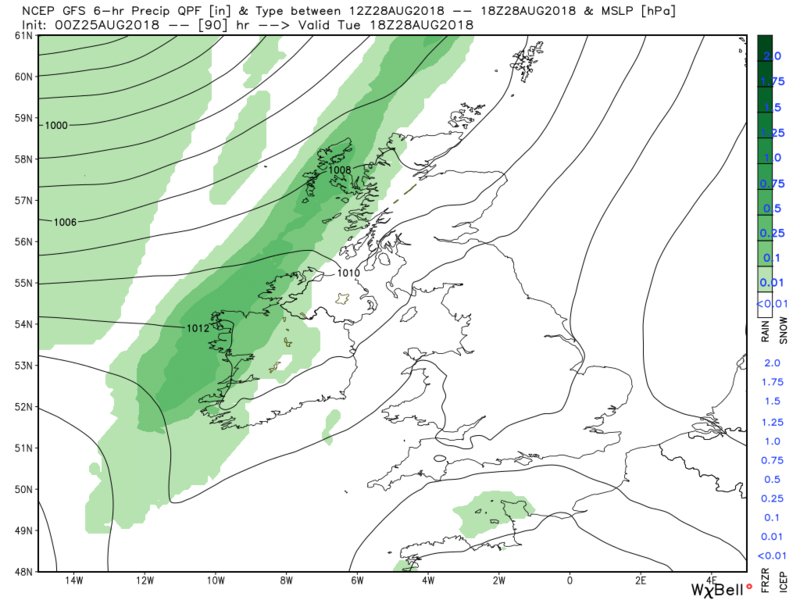 The heavy showers will slowly clear the south and east during the evening as a ridge builds from the south west overnight and through Saturday. 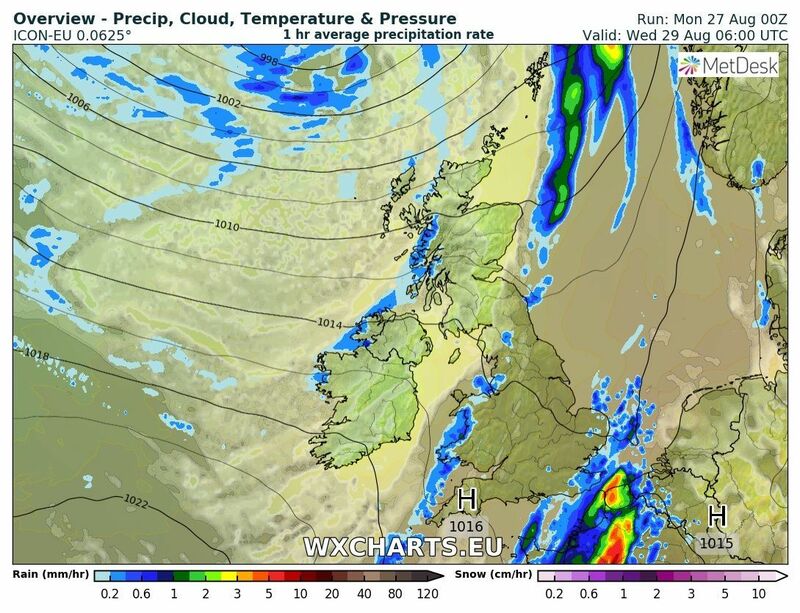 Thus much lighter winds and just a few showers mainly confined to the north west. 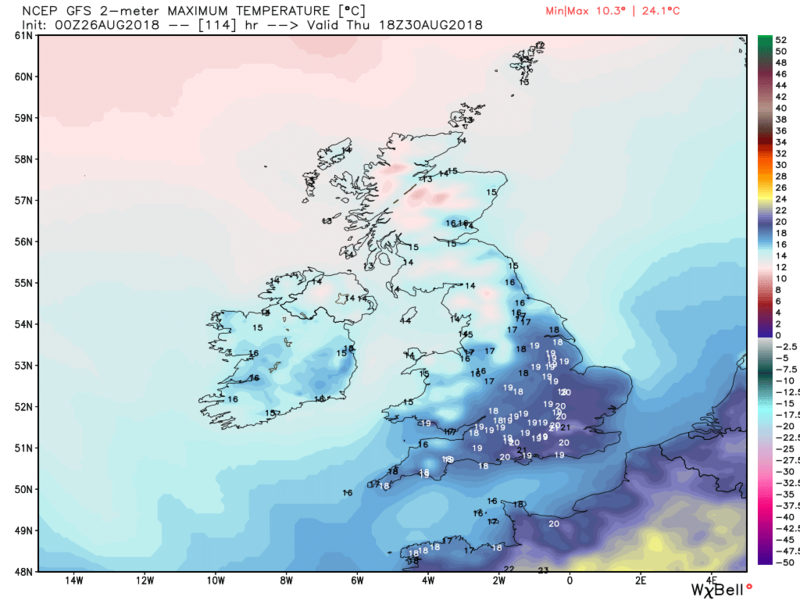 Temps still below average and with the light winds a possibility of a ground frost in the usual likely spots up north. 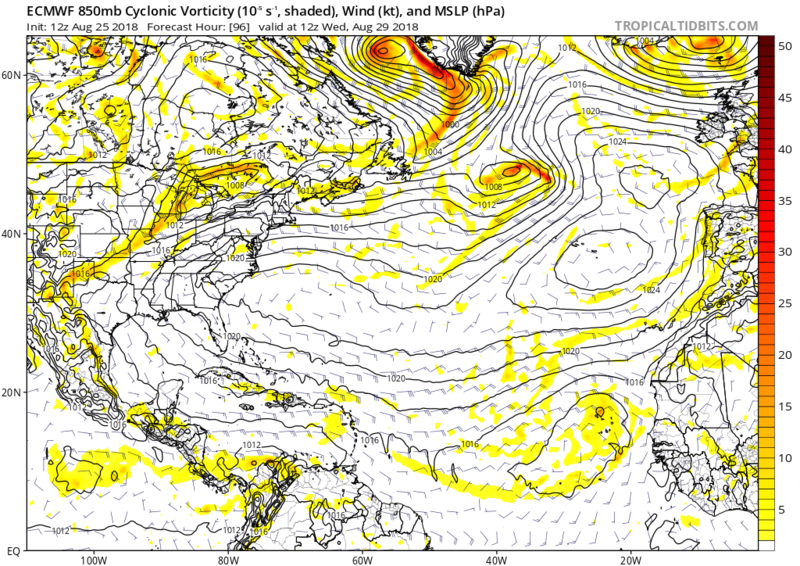 But the ridge is very transitional and out in mid Atlantic a low pressure system is getting organized and tracking east and cloud and rain from the associated fronts will effect western regions by 0600 on Sunday. 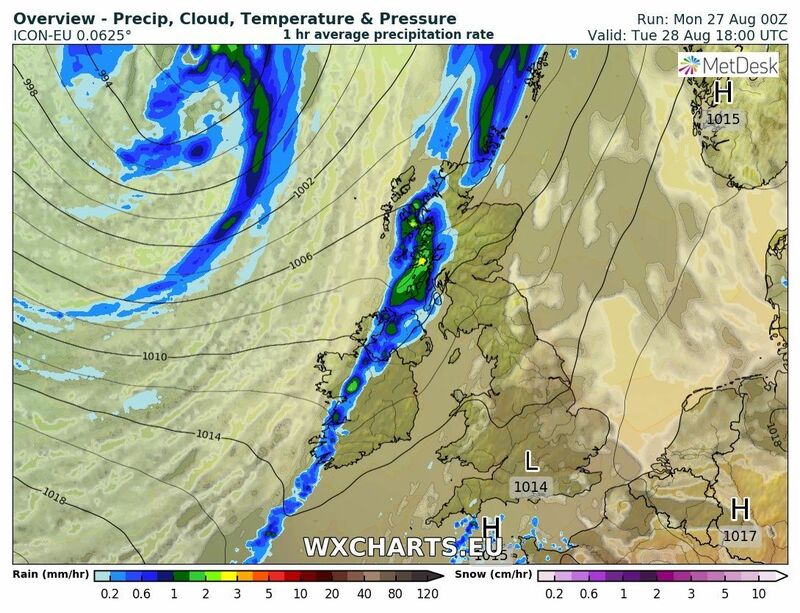 The plethora of fronts ( courtesy the senior chappy at Exeter) and the band of moderate rain will then proceed across the country clearing the east coast by midnight. 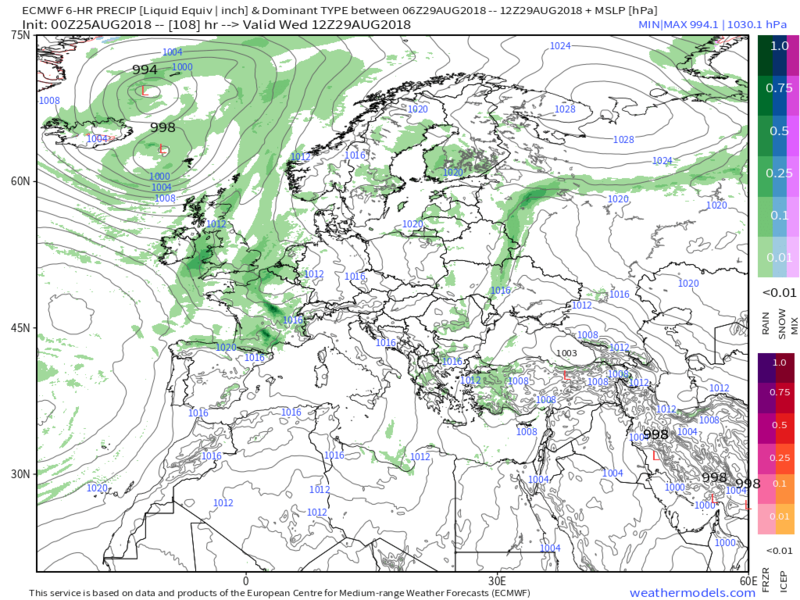 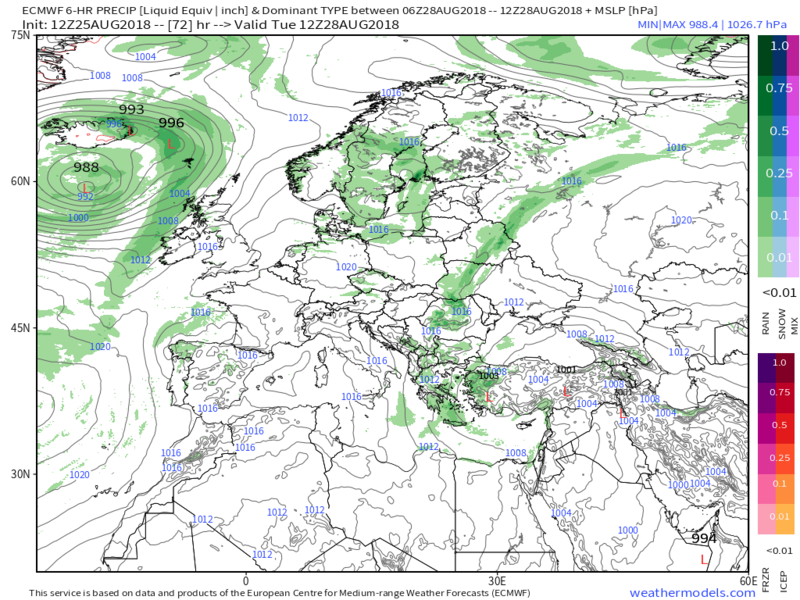 By Monday the low is over southern Norway and the, by now, amalgamated fronts well clear to the east, so a relatively quiet day with perhaps a few odd showers in the north west. 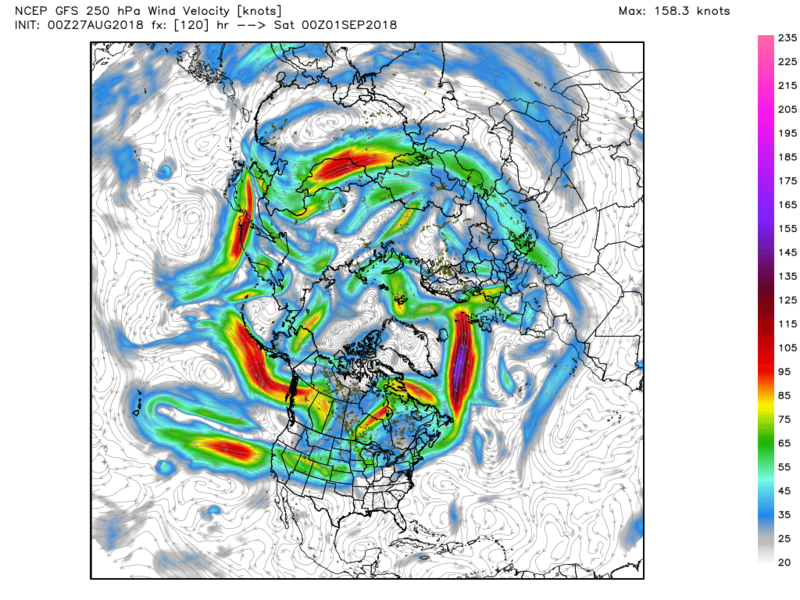 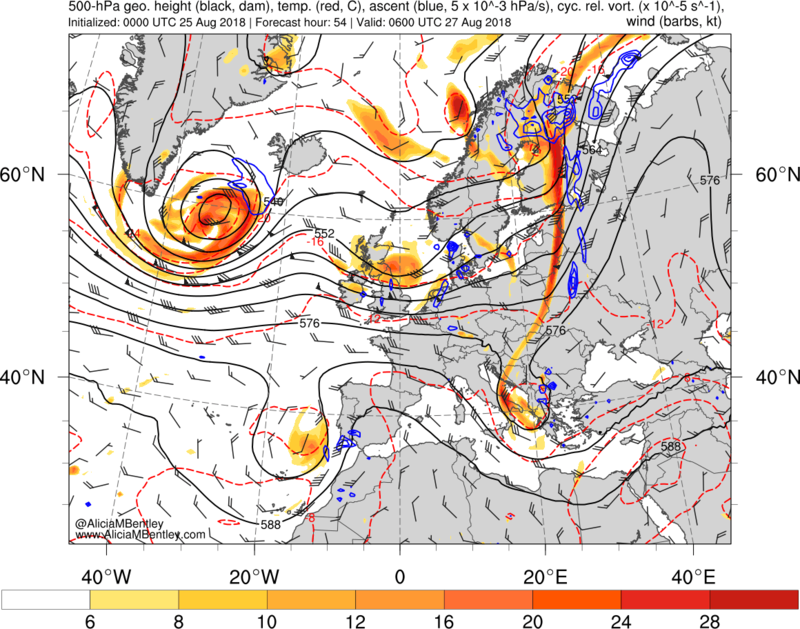 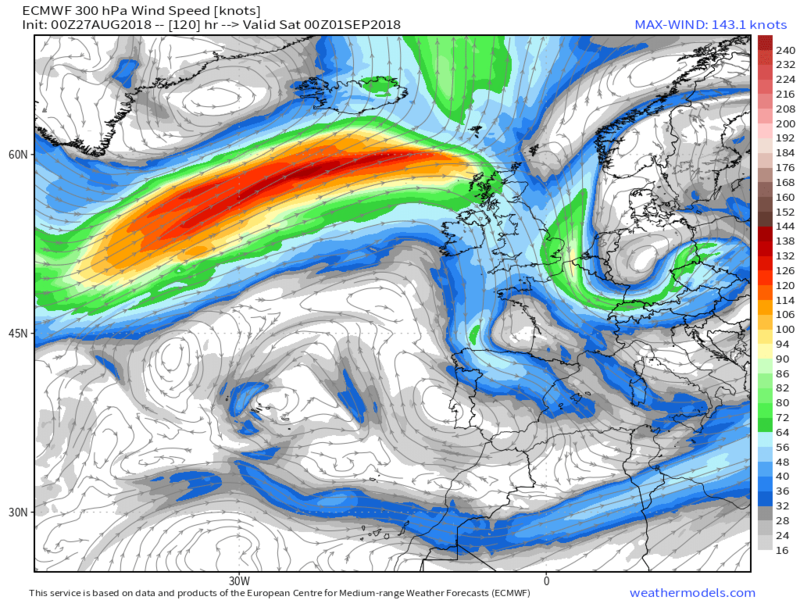 But more changes are afoot and the next approaching upper trough stretches south, assisted by the ridging high pressure in the western Atlantic, and activates the low pressure area west of Iberia. 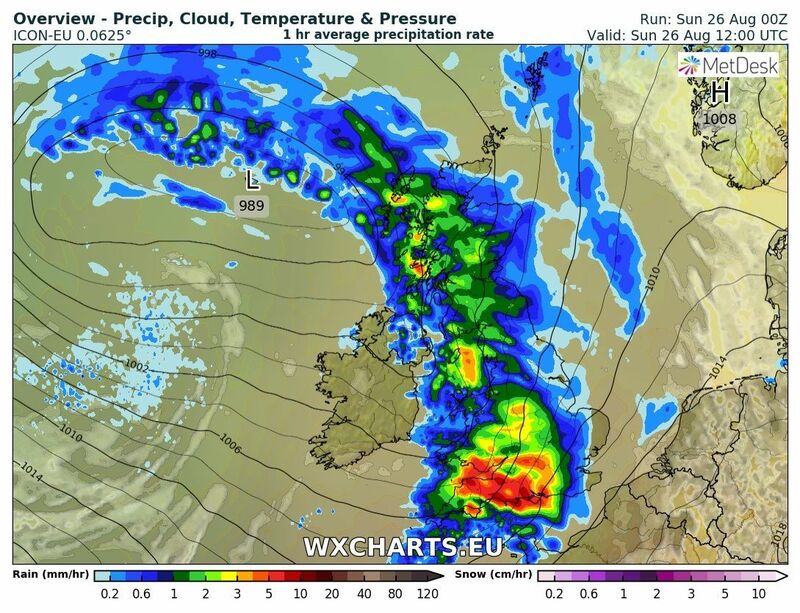 The 0600 sat image with the showery regime already in the NW. 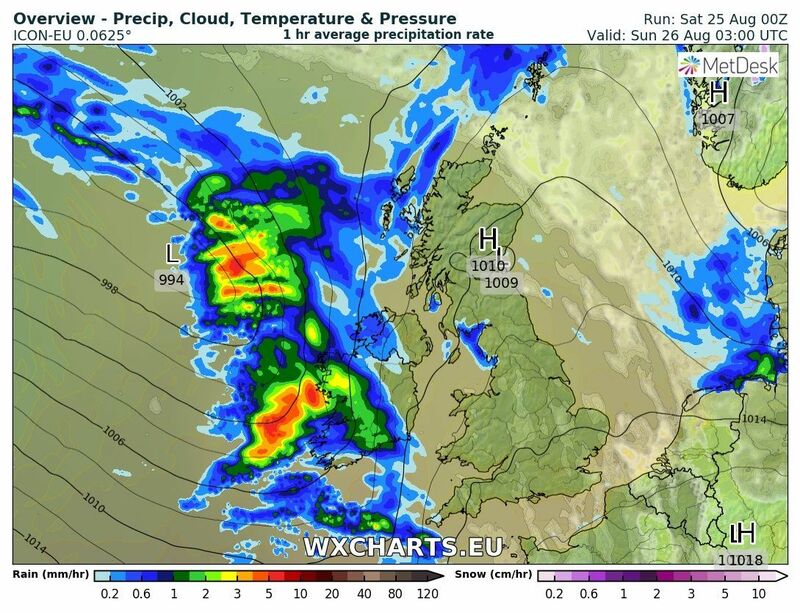 Almost total Ci cover with some Sc,Cu down here at the moment. 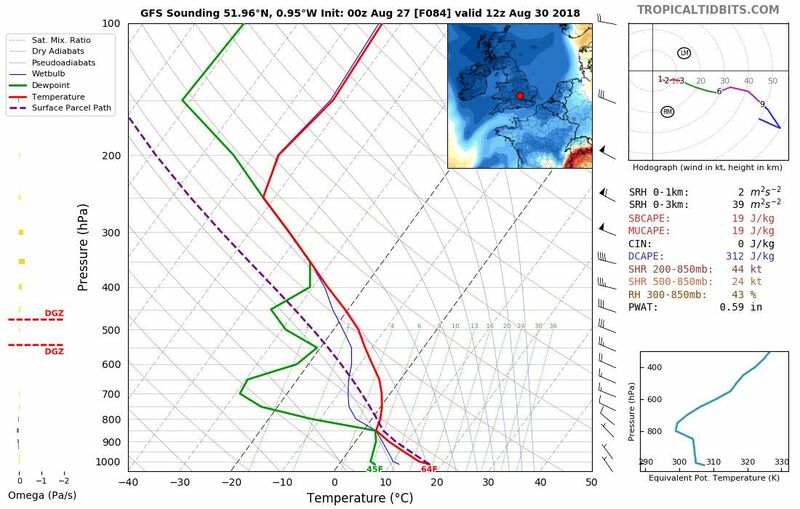 Interesting midday sounding at Camborne. 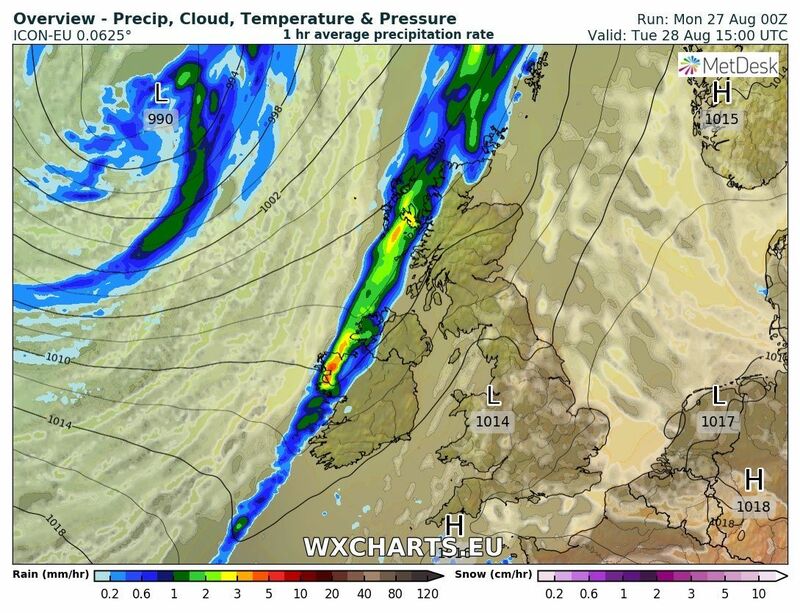 Exeter have an upper cold front in the vicinity so possible frontal imprint at 500mb with top of a cloud layer at 400mb? 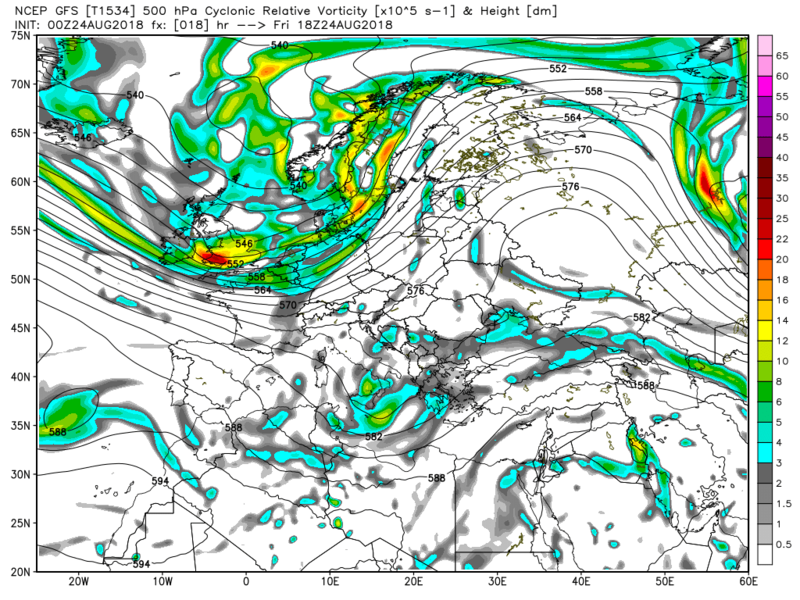 I meant to add note the difference with the airmass over N. Ireland.  Thanks for the excellent daily summaries, Knocker. 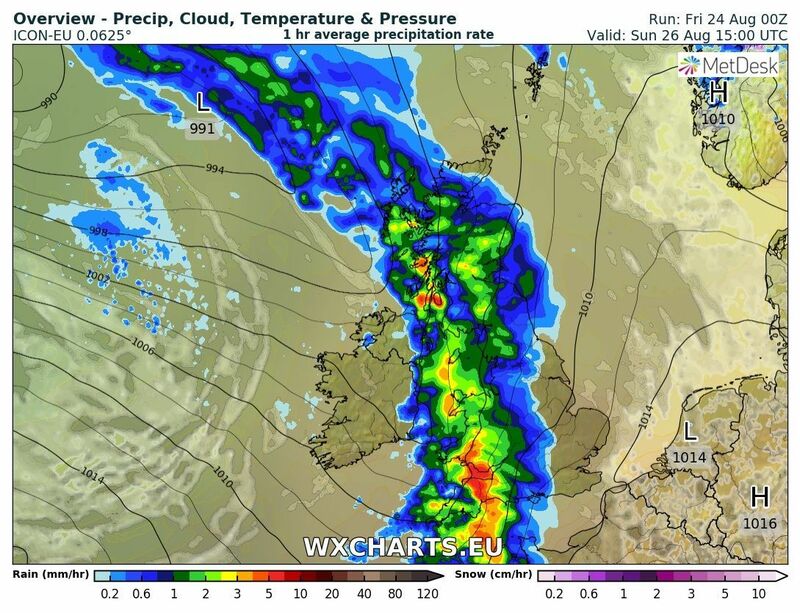 Best forecasts around. 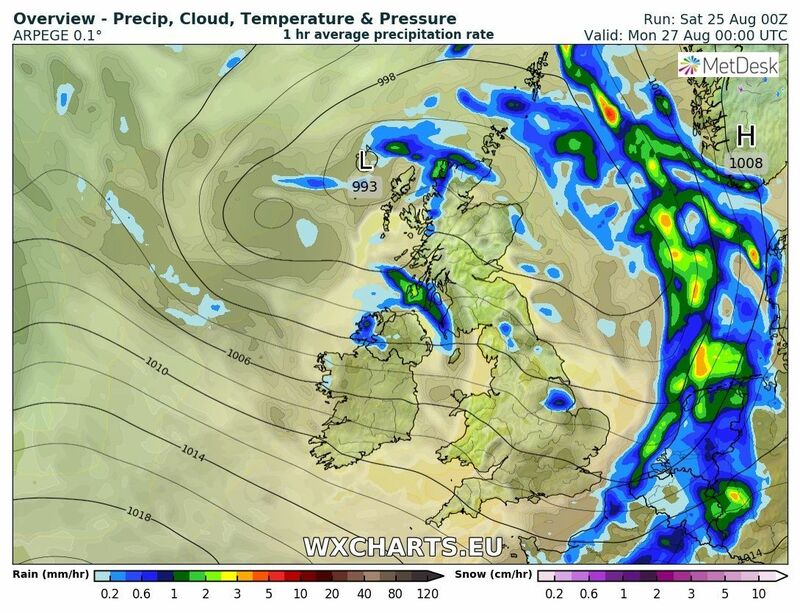 I'm looking at nine hours of uninterrupted rain here on Sunday, by the look of it. 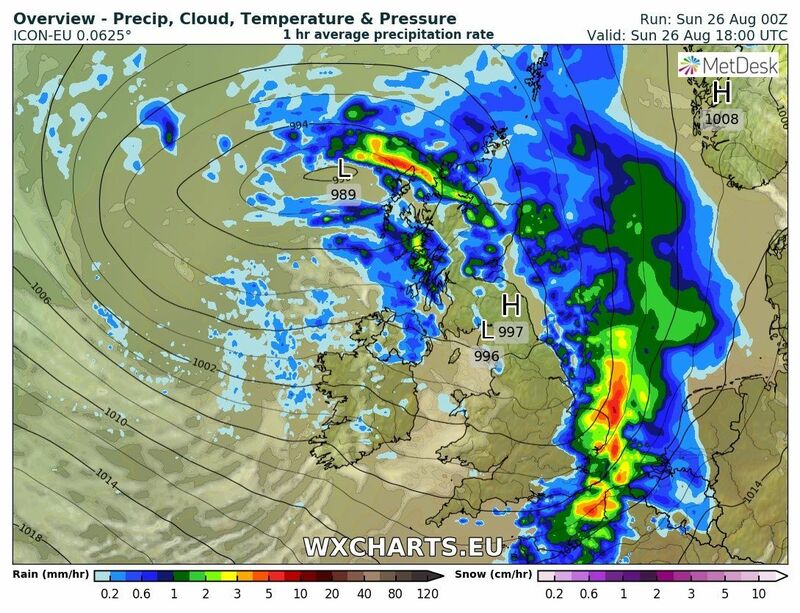 Mustn't grumble, though. 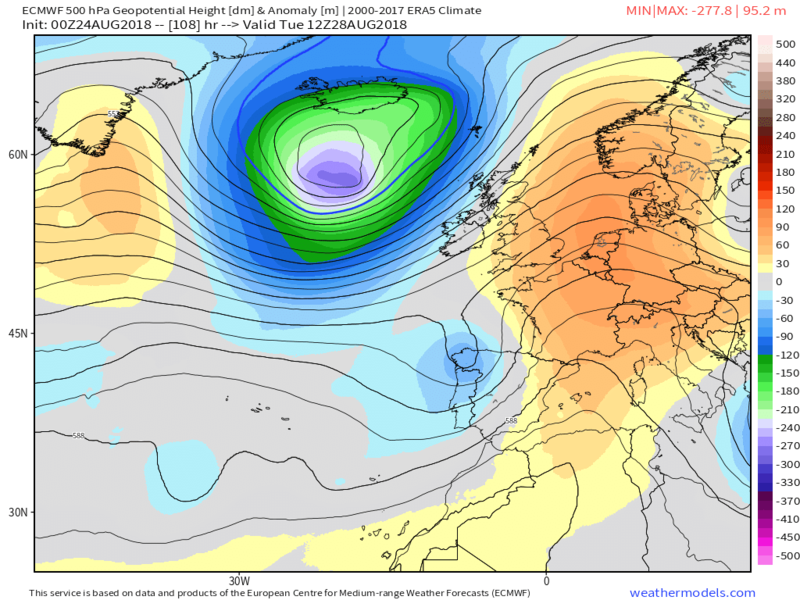 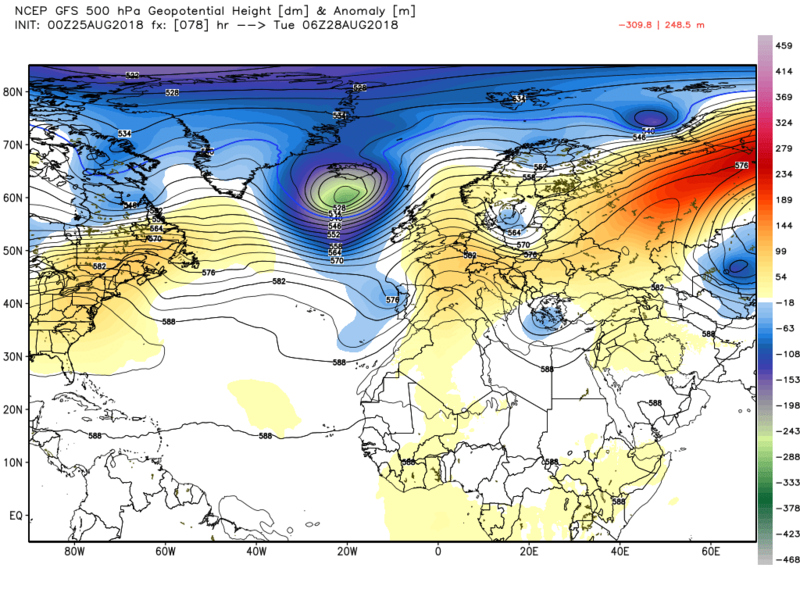 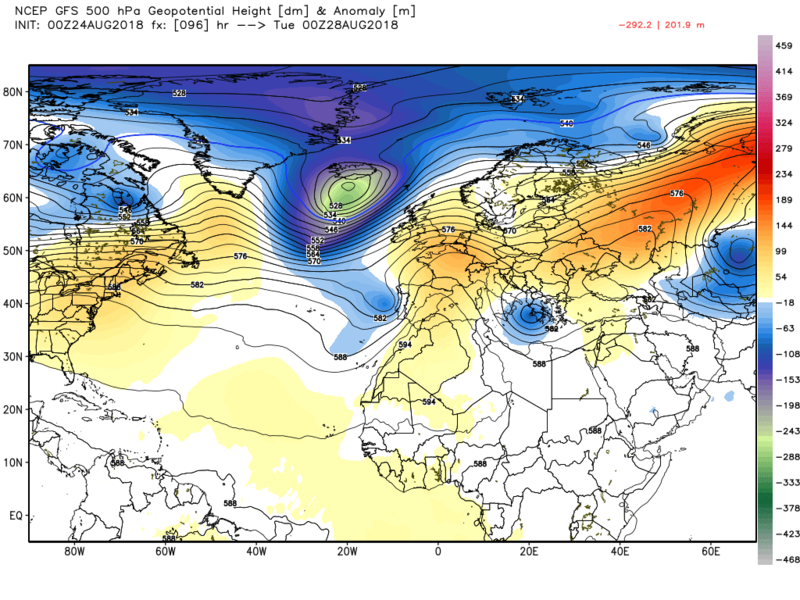 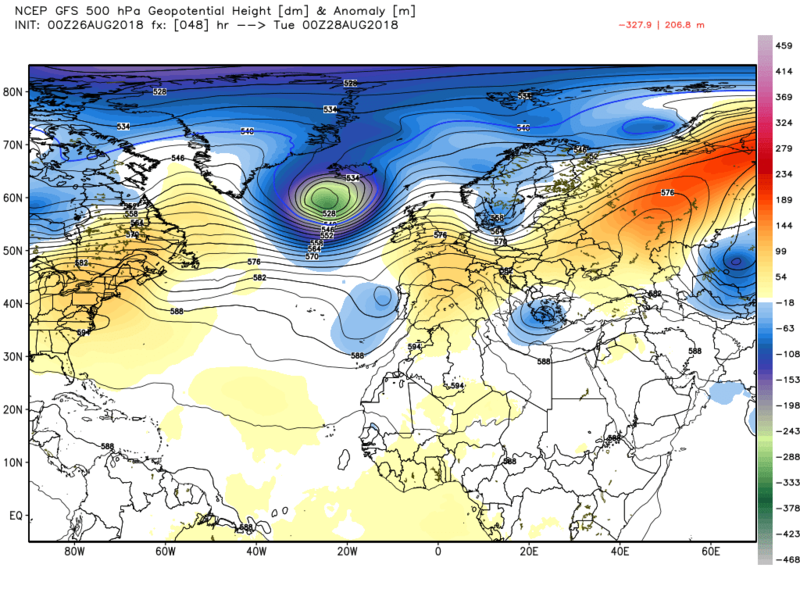 Last evening’s EPS short range anomaly is still indicating the vortex over the Arctic with associated trough down through Greenland into the central/east Atlantic but with the Azores attempting to ridge north east over the UK the strong westerly upper flow is forced to veer NW over the UK portending once again a N/S split with temps a little below average. 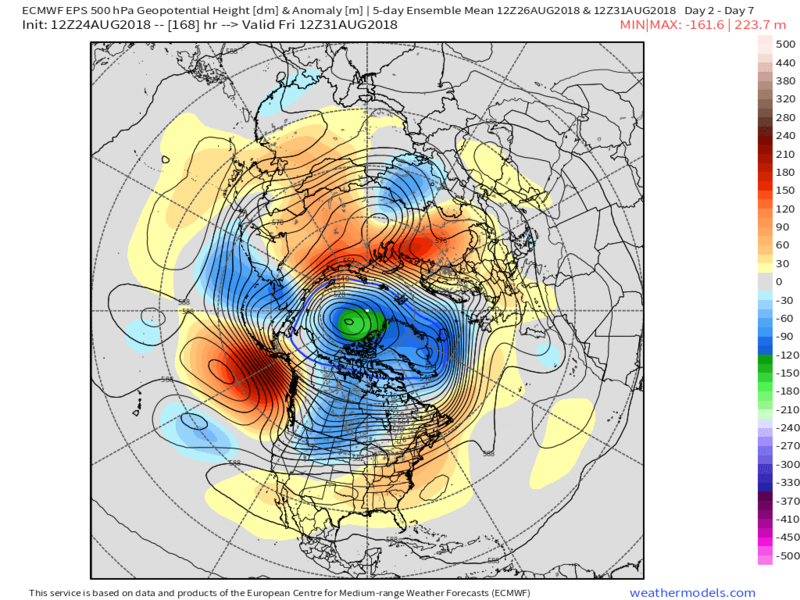 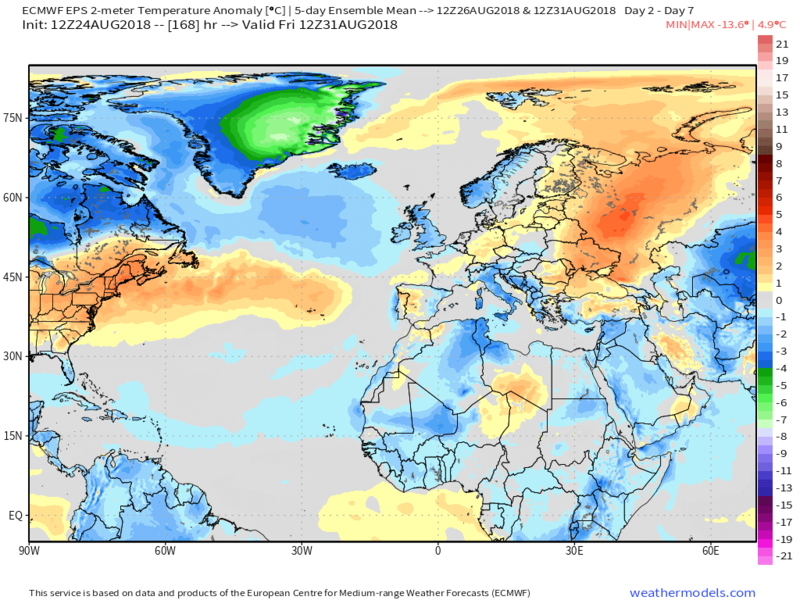 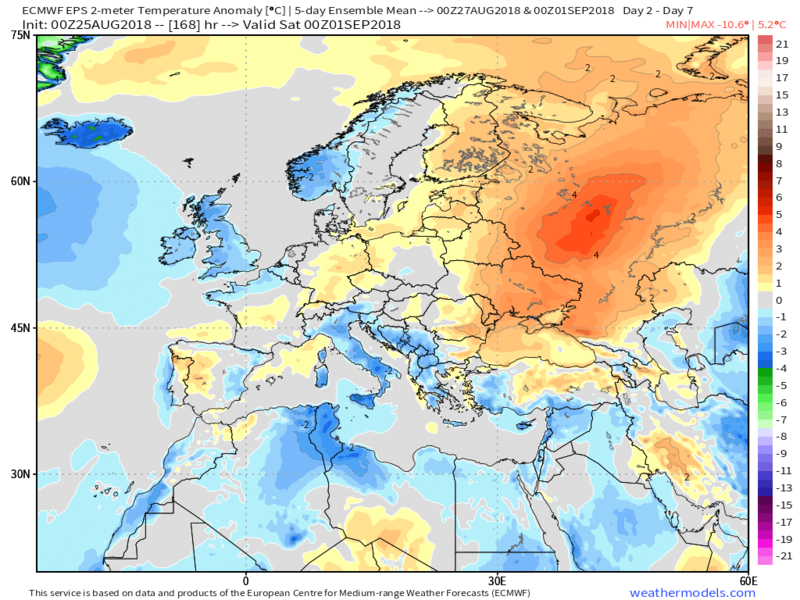 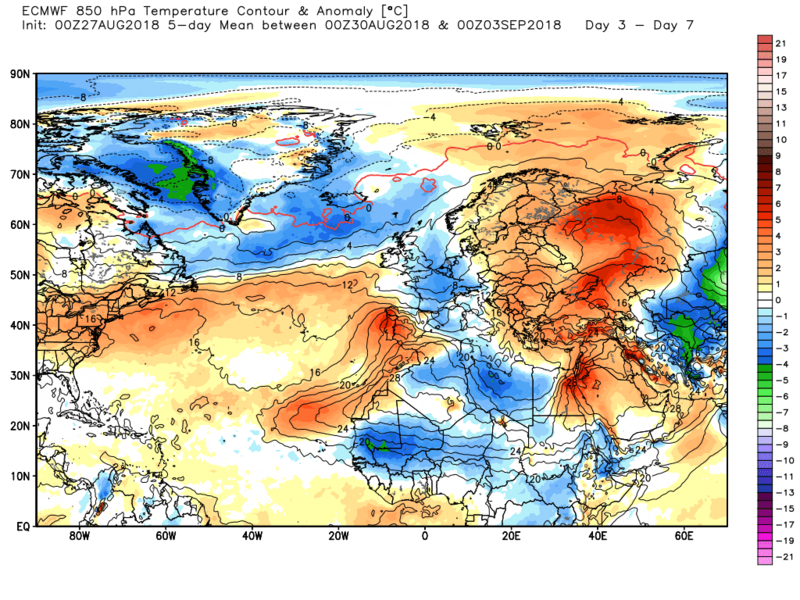 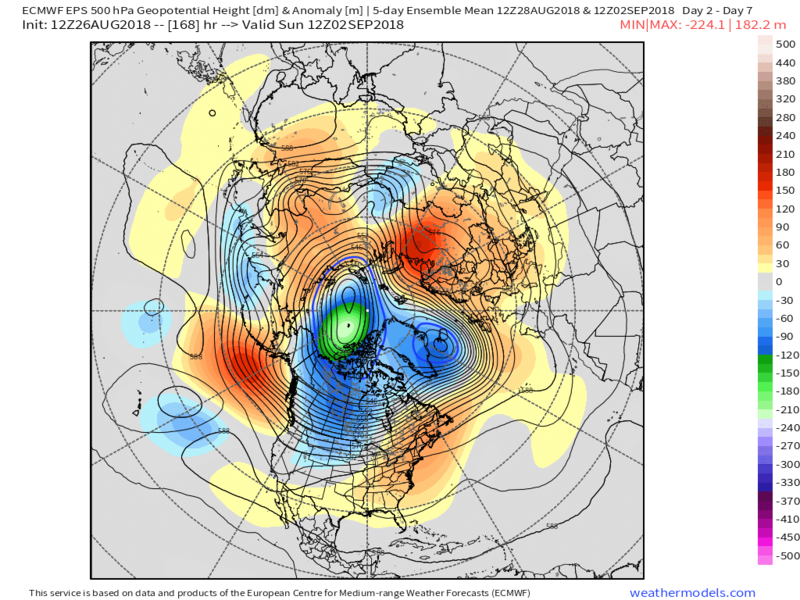 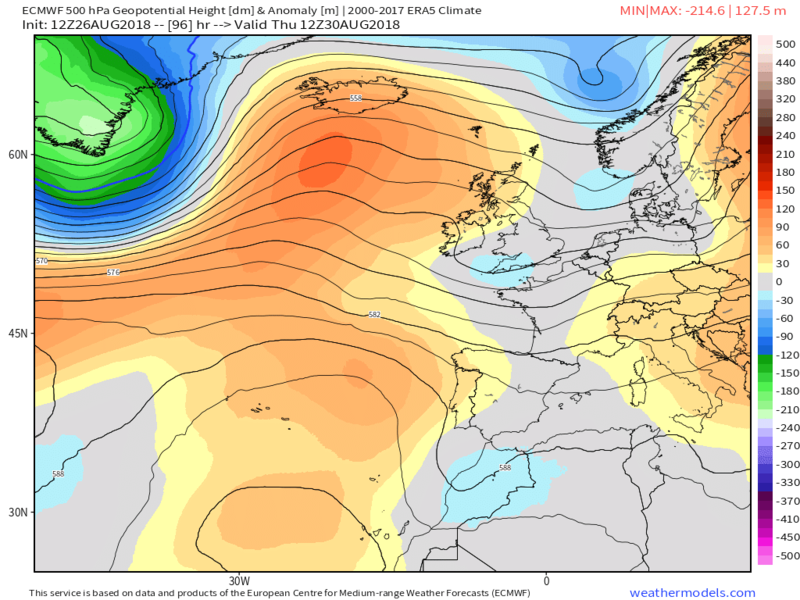 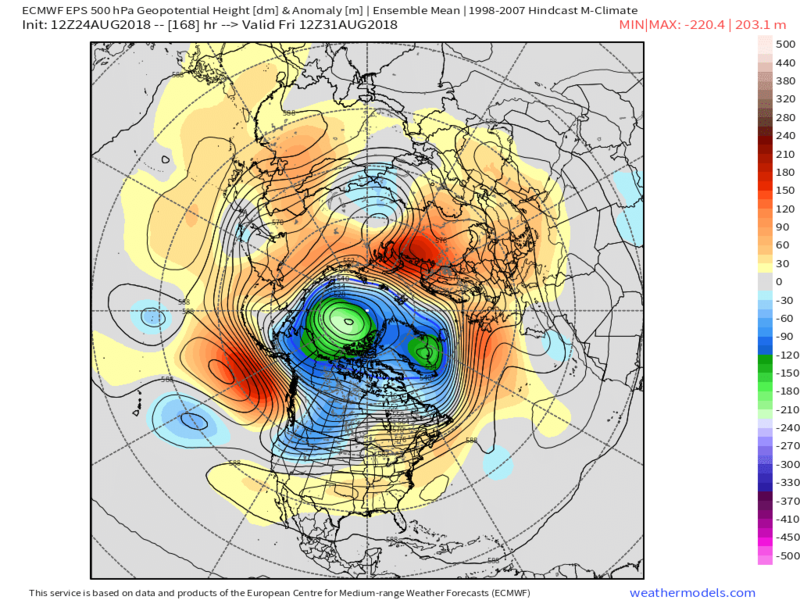 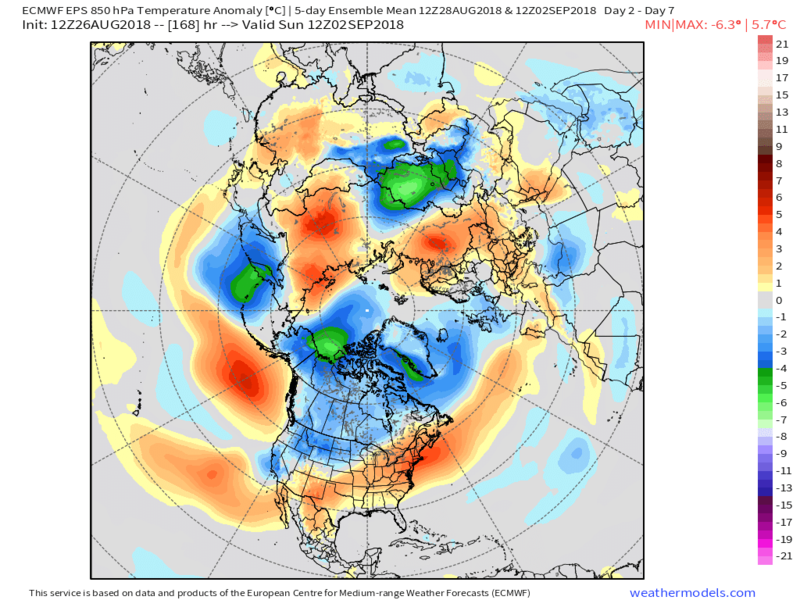 But this does disguise a trend towards the end of the period for stronger ridging in north east Europe, retrogression of the trough and more pronounced ridging by the Azores. 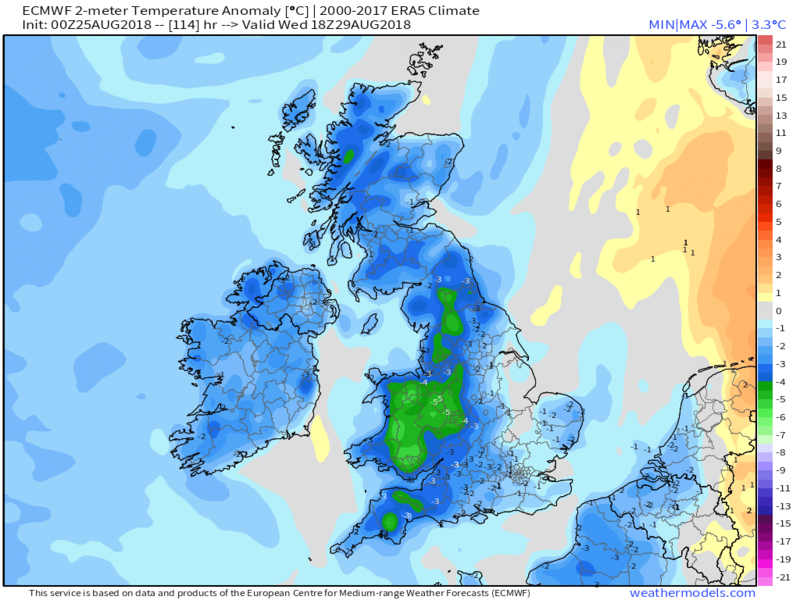 The actual detail is a bit of a mixed bag, particularly this weekend, before a gradual improvement, albeit still changeable for a while. 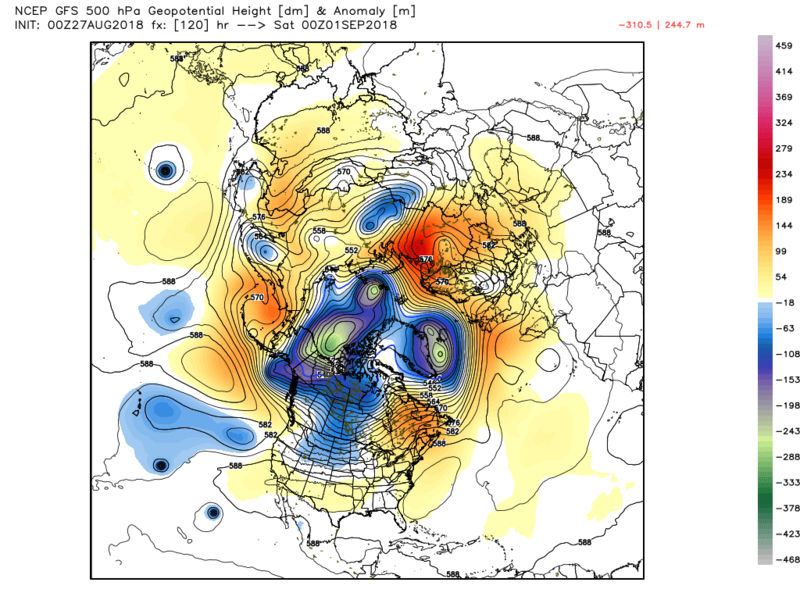 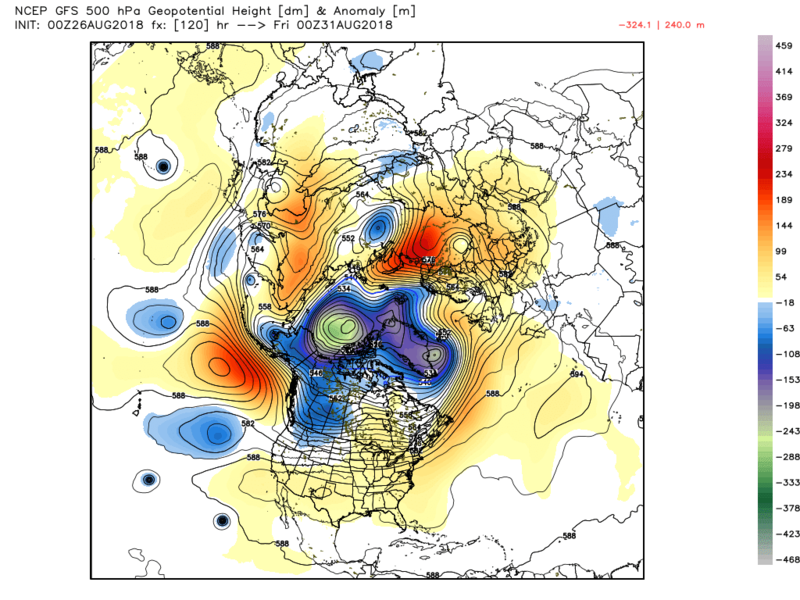 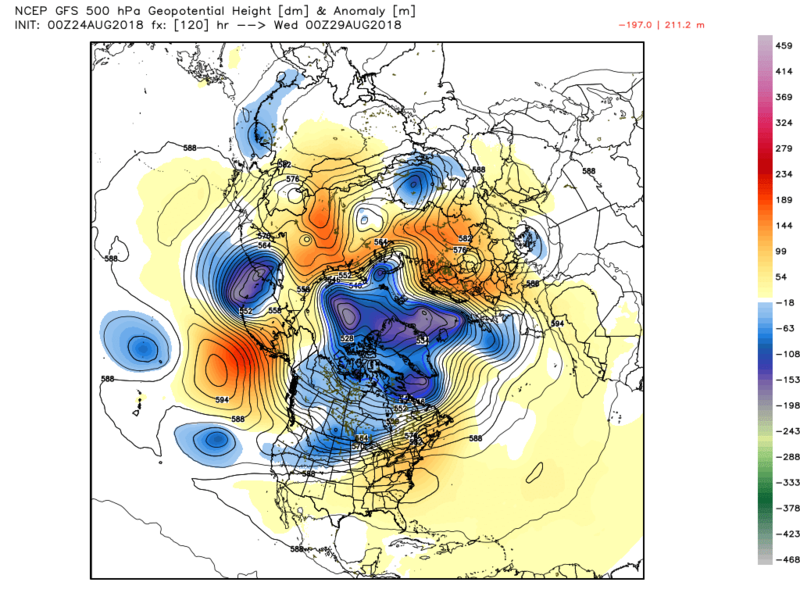 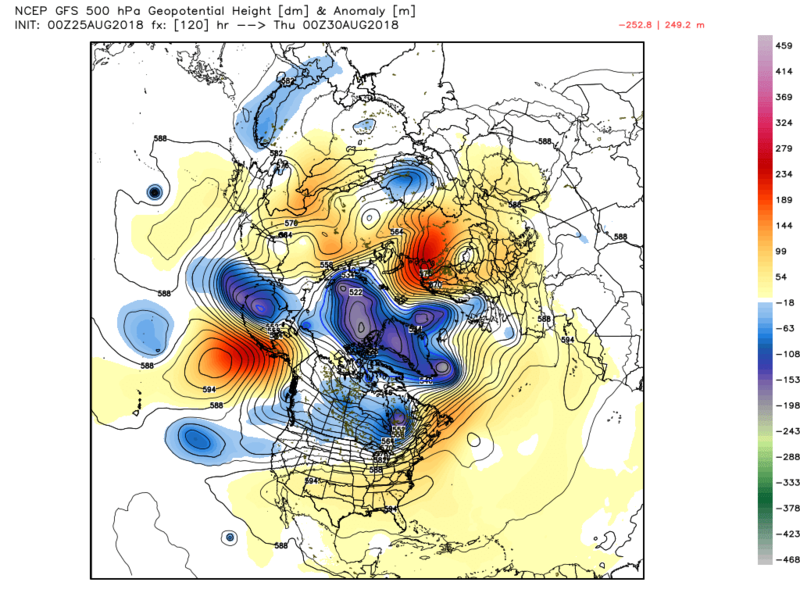 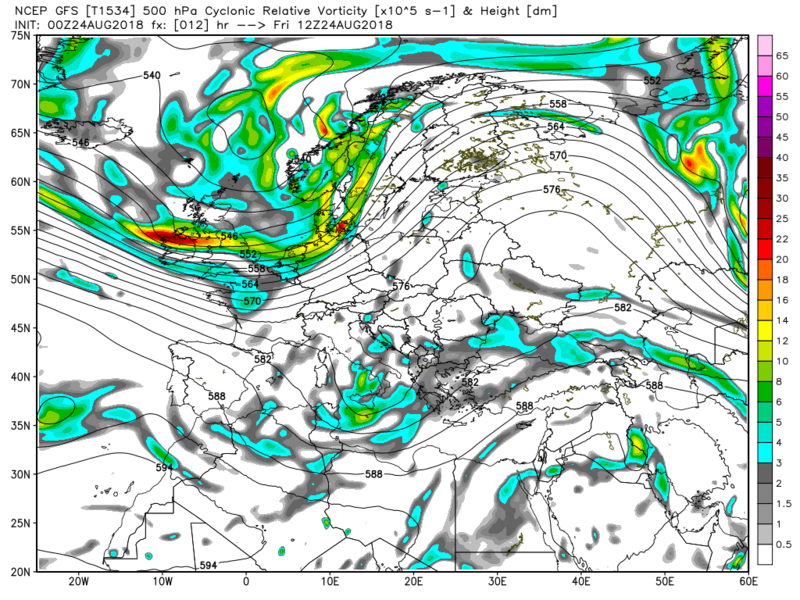 and this is essentially the story for today as a transient ridge builds north east. 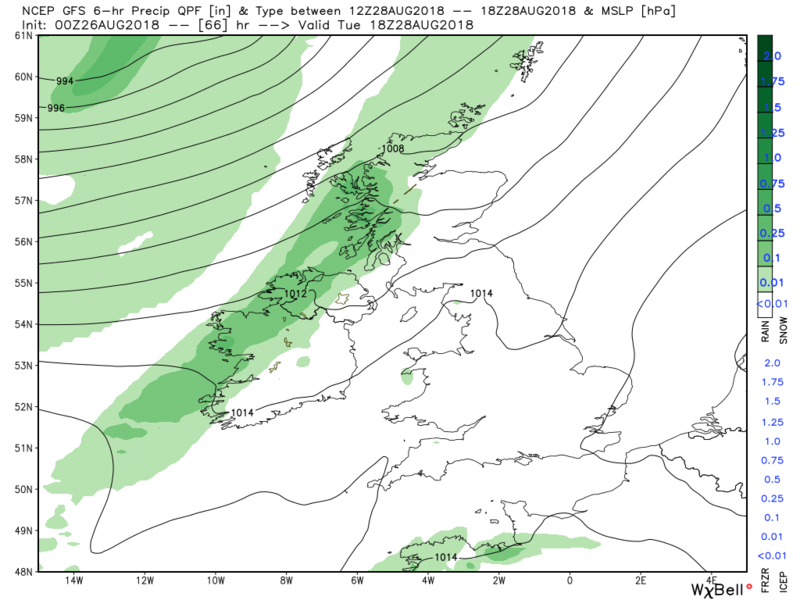 Thus much lighter north westerly winds than yesterday and just a few showers, mainly around north westerly coasts, but some could pop up elsewhere. 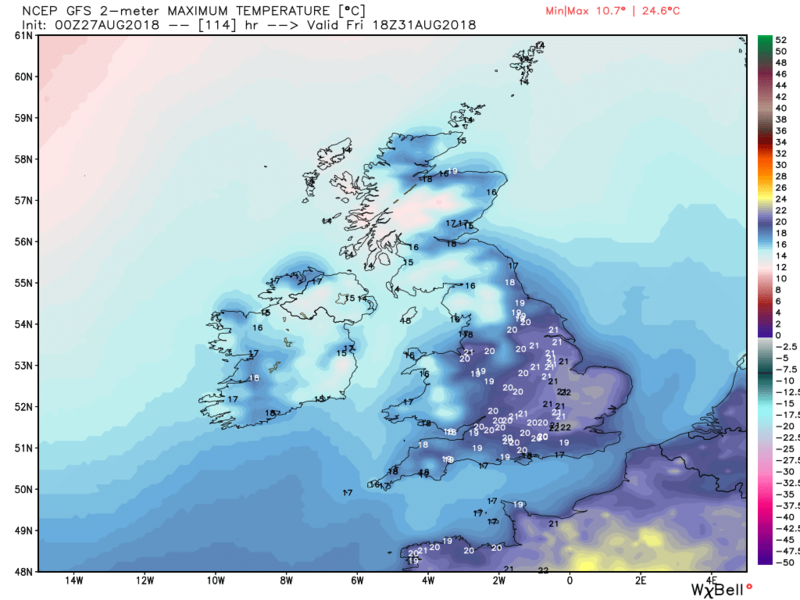 A cool day after a chilly start but not feeling too bad in the lighter winds. 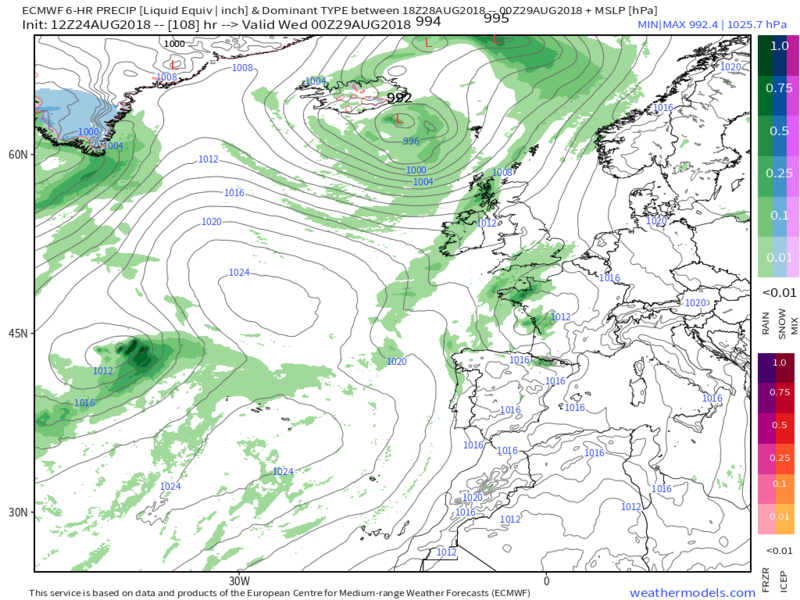 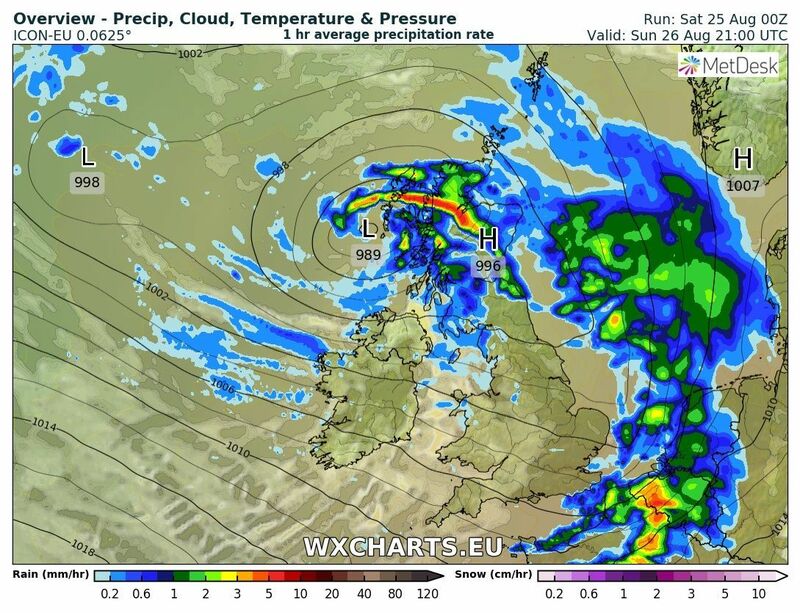 but as can be seen a depression out in the Atlantic is tracking east and after a clear night on Saturday cloud and rain, along with increasing wind, from the associated fronts will start to impact western coastal regions by 0300 Sunday morning. 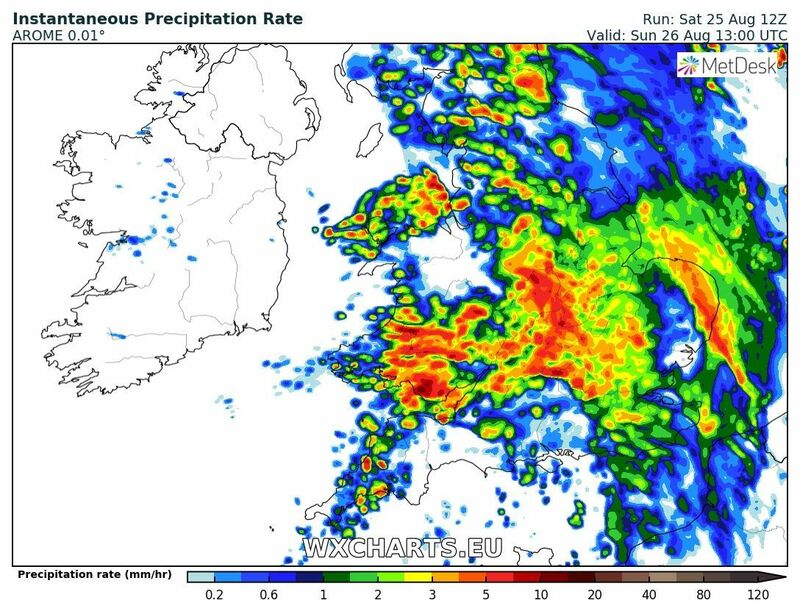 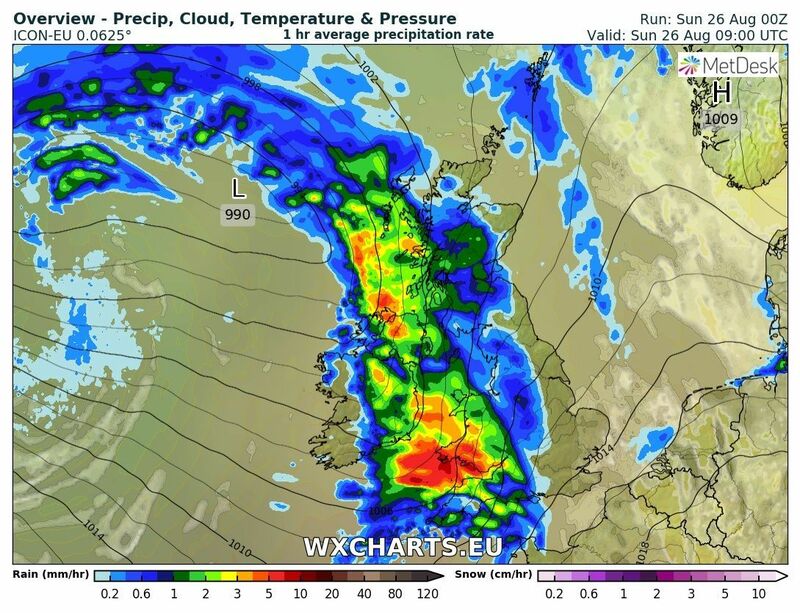 This belt of rain, that will be interspersed with heavier outbreaks, will traverse the country during Sunday, effecting all regions, before clearing the east coast by evening. 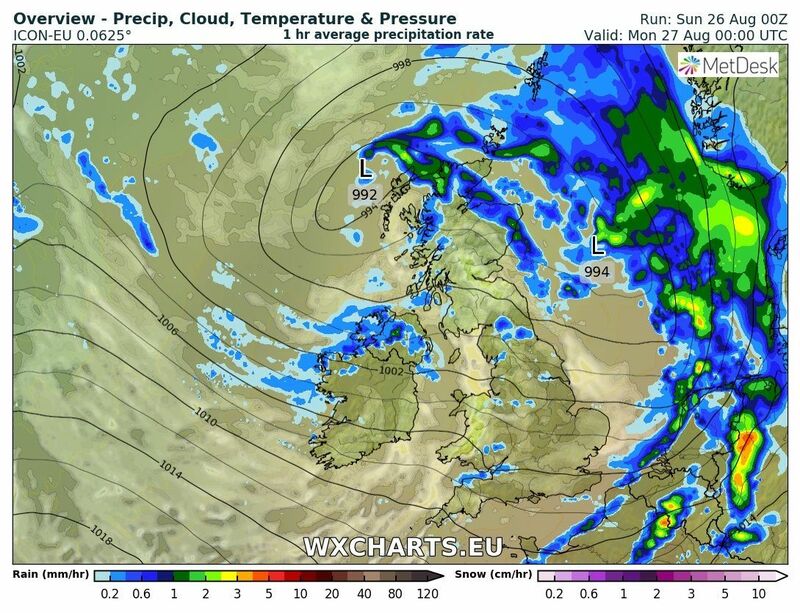 So in a nutshell a wet and windy and generally unpleasant day. 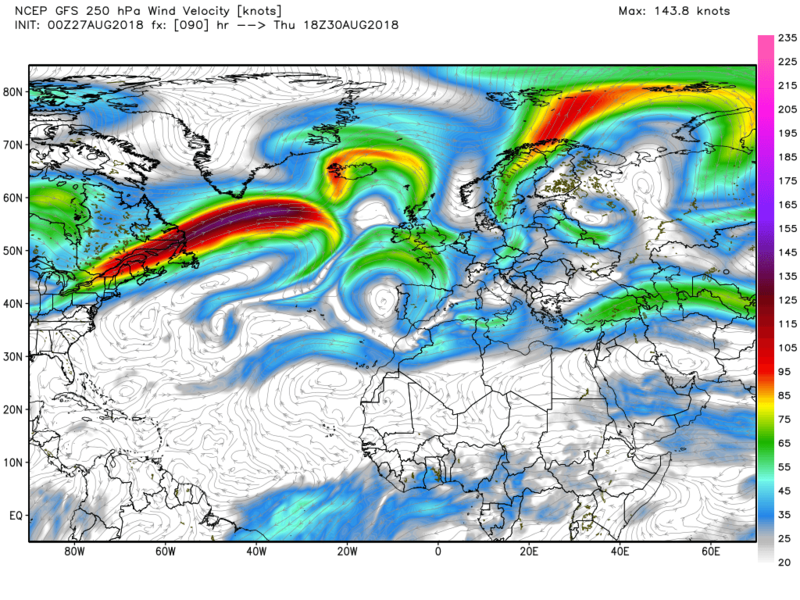 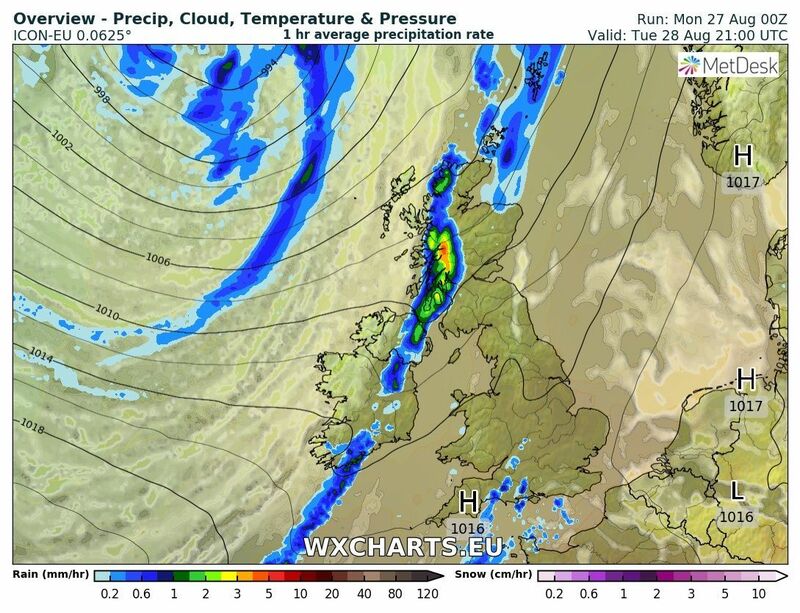 The rain will linger a while over Scotland and N. Ireland overnight Sunday/Monday, as the low drifts further east, but once clear Monday will be a much drier day, with perhaps the odd shower, as another transient ridge makes another brief appearance initiating a light north westerly. 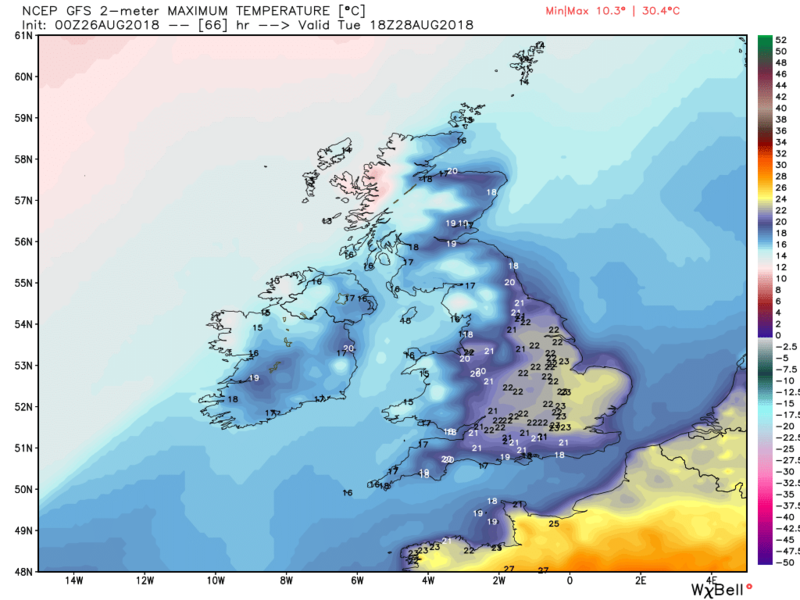 Temps around average or a tad below. 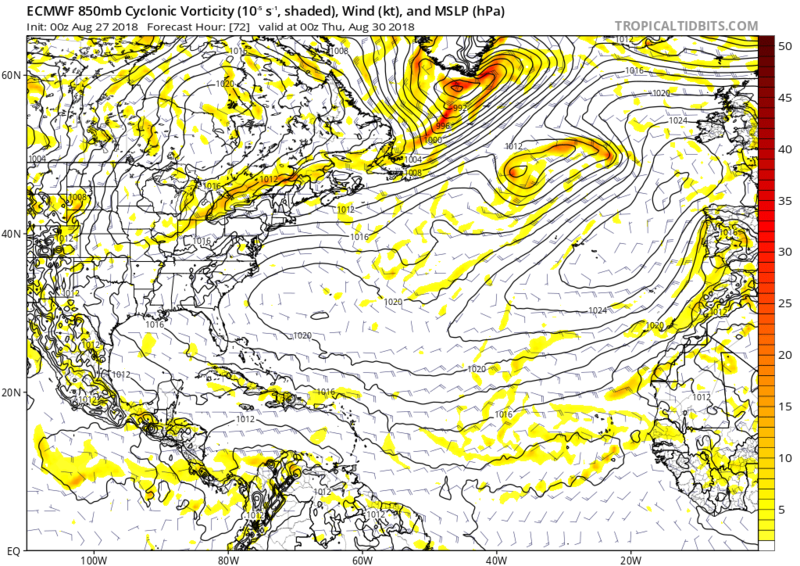 and on the surface this initiates a double whammy. 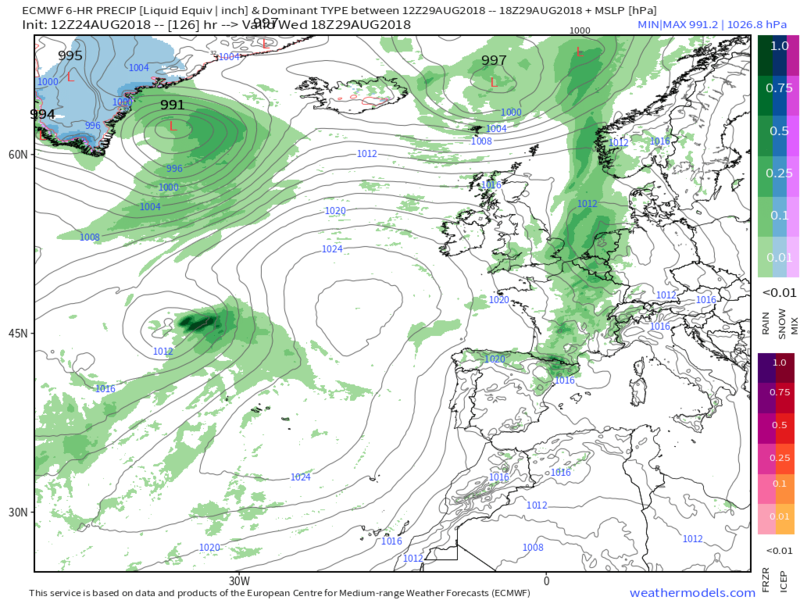 On Tuesday cloud and rain from the fronts associated with the surface low south of Iceland will effect north western regions whilst later in the day and overnight into Wednesday showery thundery rain will effect the south east as the activated shallow low tracks north east across France into the North Sea. 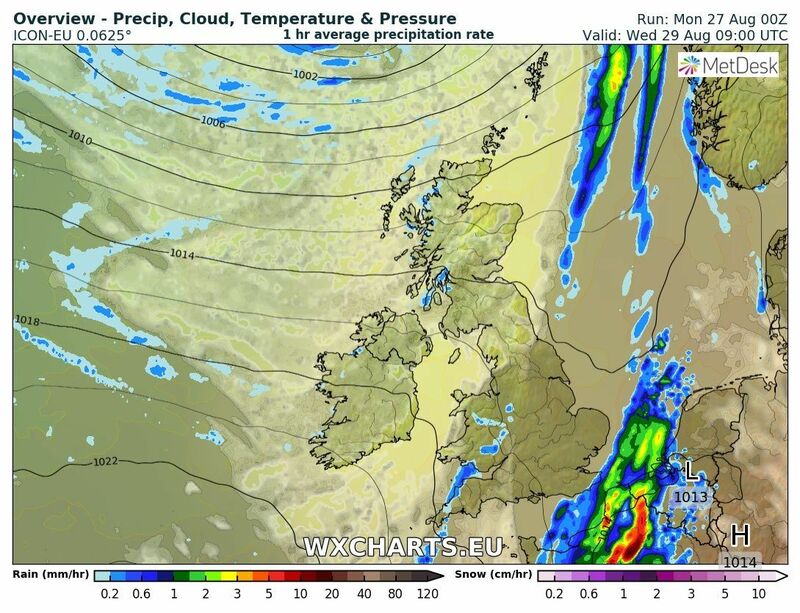 At the same time the cold front and light patchy rain effecting the north west will move slowly south east. 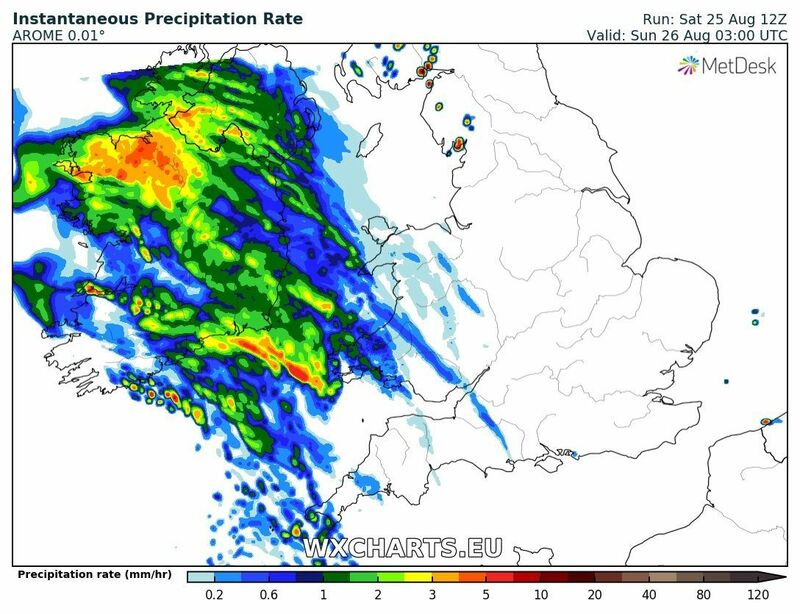 Apologies if the first part of this post is a tad parochial as I'm off on a early start tomorrow on a coach trip to the South Devon railway and the weather ain't favorable, putting it mildly. But the detail is a tad confusing. 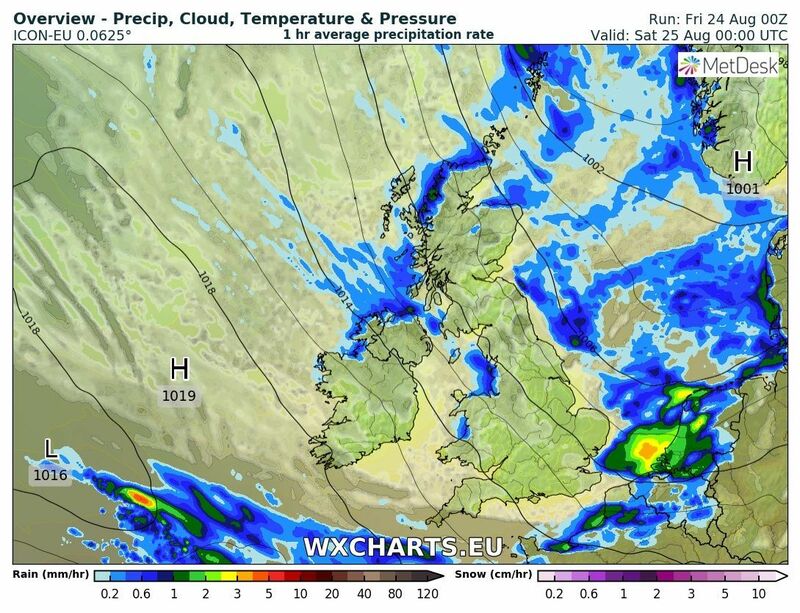 The latest fax for 1200 tomorrow has the south west in the warm sector with an upper cold front confusing the issue. 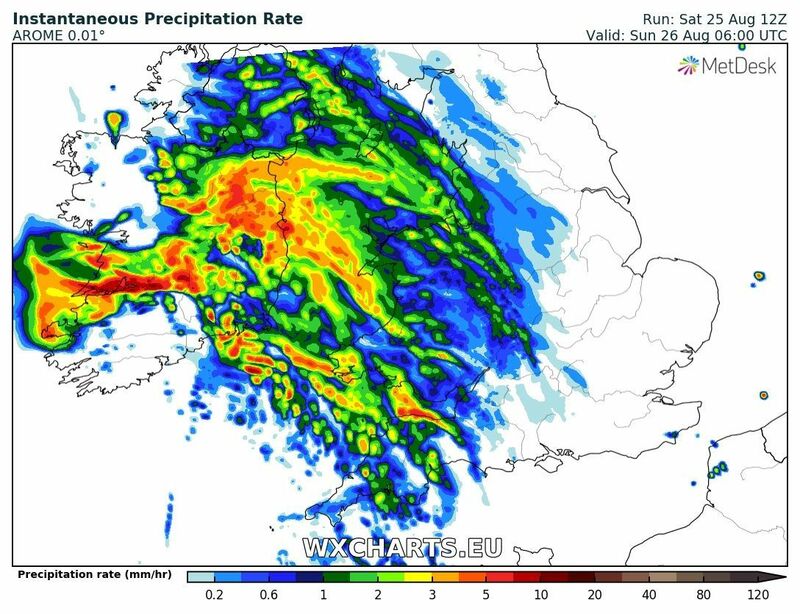 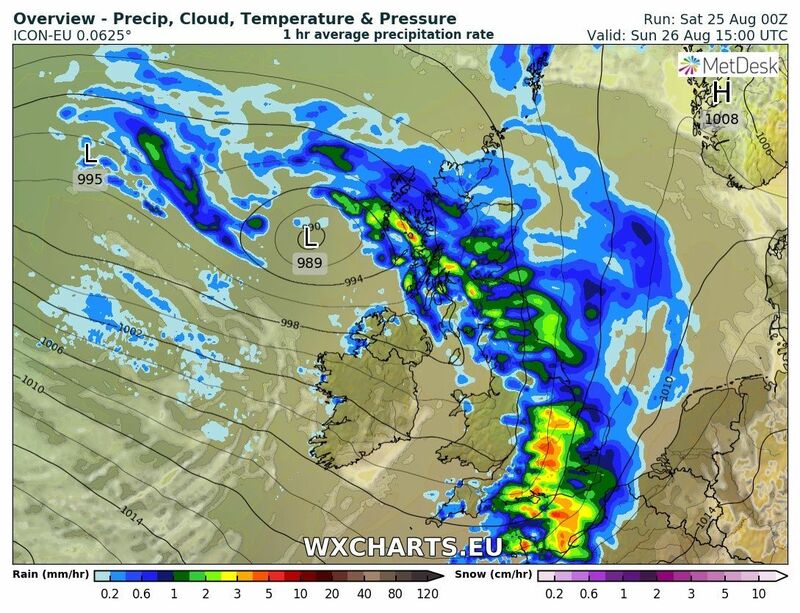 Which isn't too bad if the Arome is correct with the rain effecting Cornwall from 0300 but most of the heavy stuff further north and it would appear the cold front is through around 1300 which means it would have to get it's skates on. 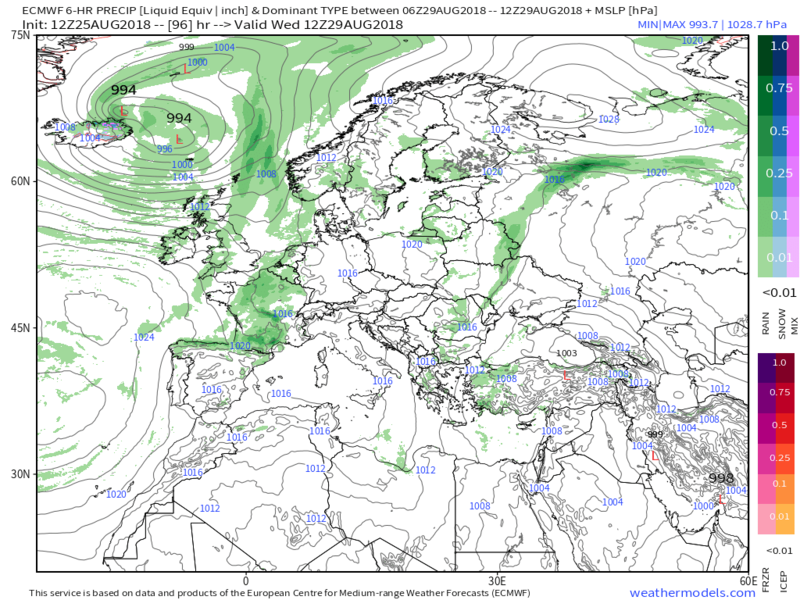 If we now pop forward to 1200 Tuesday and the above low is now in the Baltic with the cold front now waving across France and the new cold front associated with the low south of Iceland brings rain to the north west. 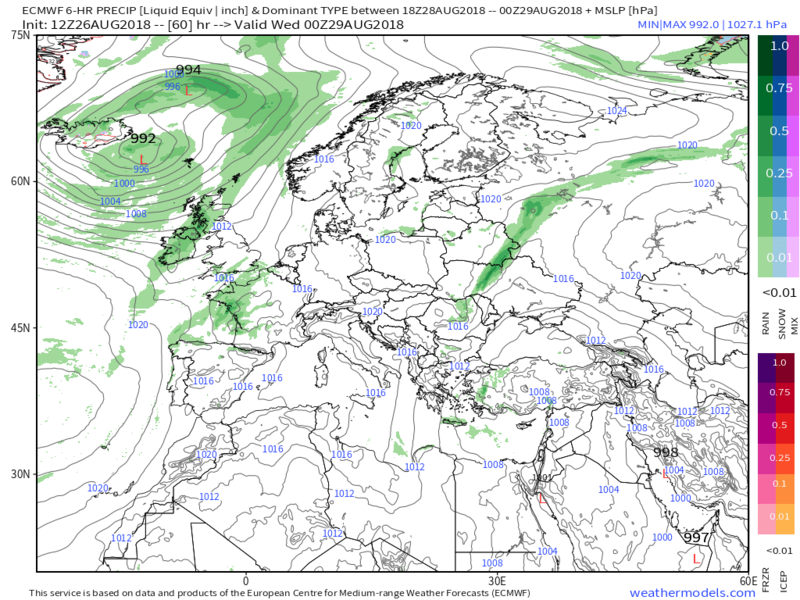 over the next 48 hours the cold front to the NW tracks south east down the country whilst some convective activity just impacts the south east en route from France to the North sea, before another transient ridge builds. 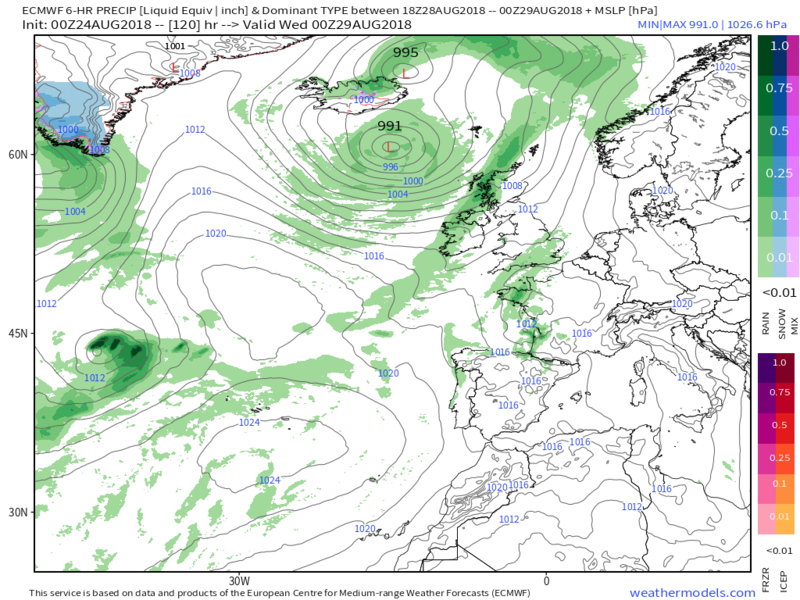 At midnight the surface analysis shows a low 993mb south of Iceland with a plethora of fronts lined up to west about to bring rain and strong winds to virtually all of the UK over the next 24 hours. 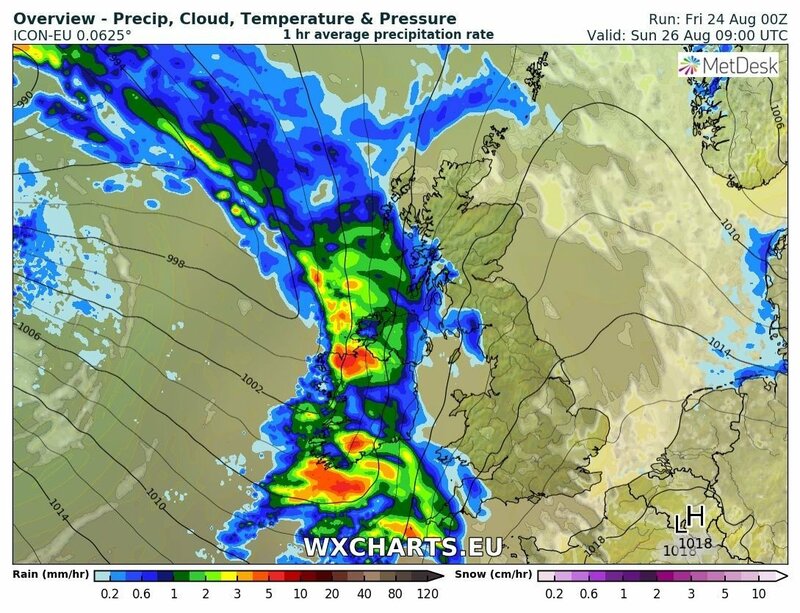 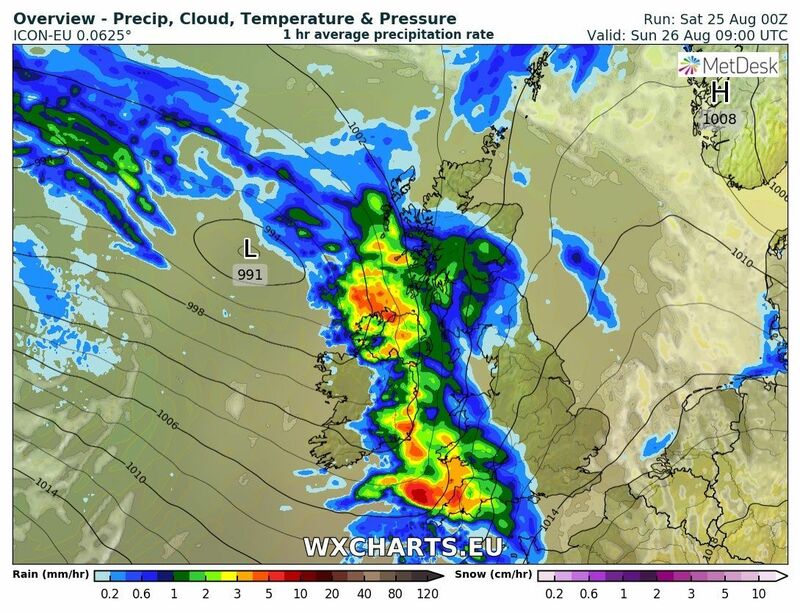 By evening the main rain belt and cold front will be over the North Sea but the filling low and occlusion will be drifting across Scotland thus showery rain will persist for a while in the north whilst elsewhere has a relatively clear night apart from the odd shower in the west. 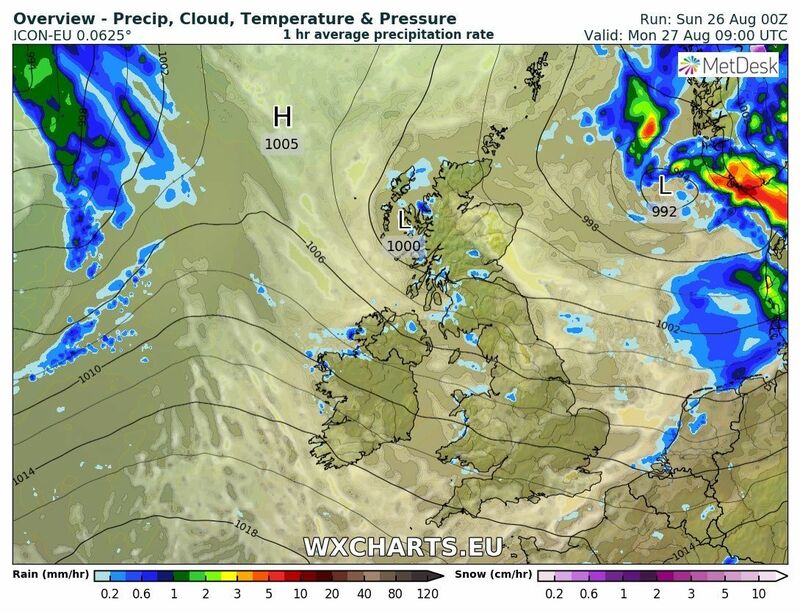 And this will herald a much brighter and warmer day on Monday as the low continues to drift into southern Norway with just the odd shower around in the north west in the now, much lighter, north westerly breeze. 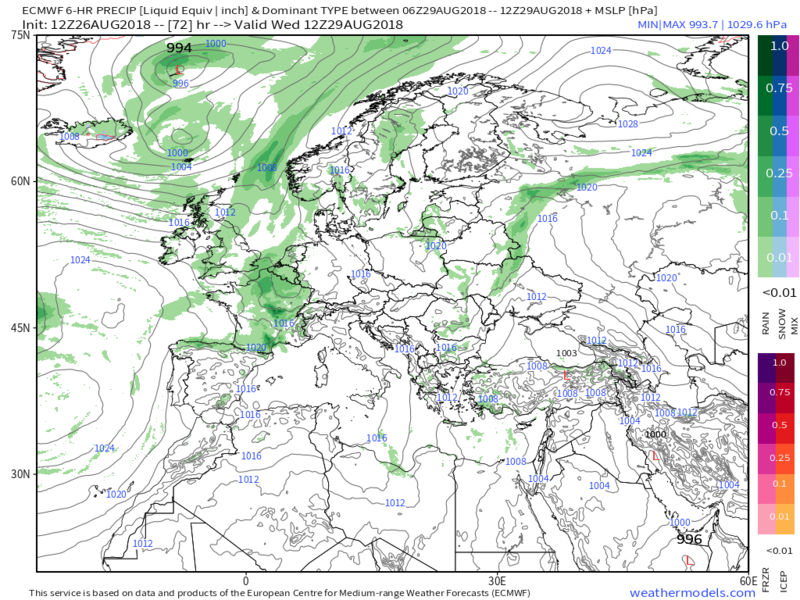 and the cold front associated with the surface low will track east and bring rain to north western parts during Tuesday whilst our old cold front is now waving across France, north of a shallow thundery low. 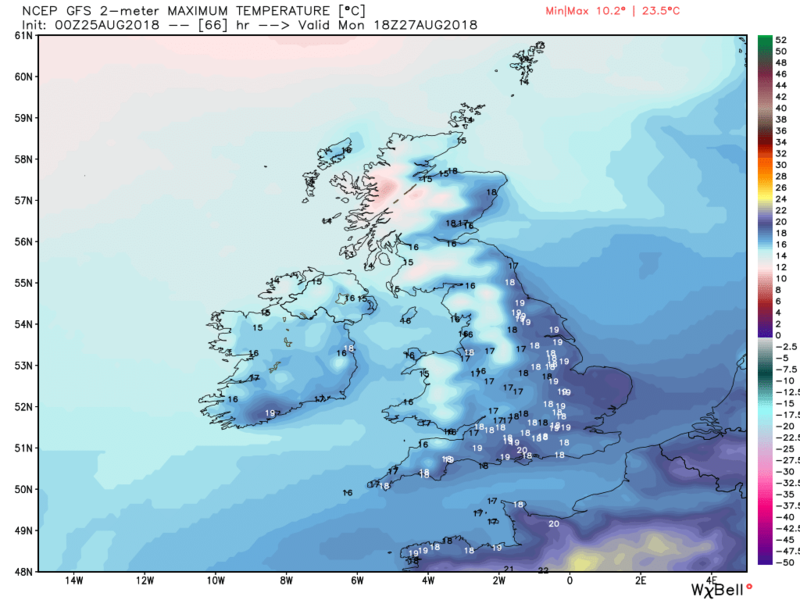 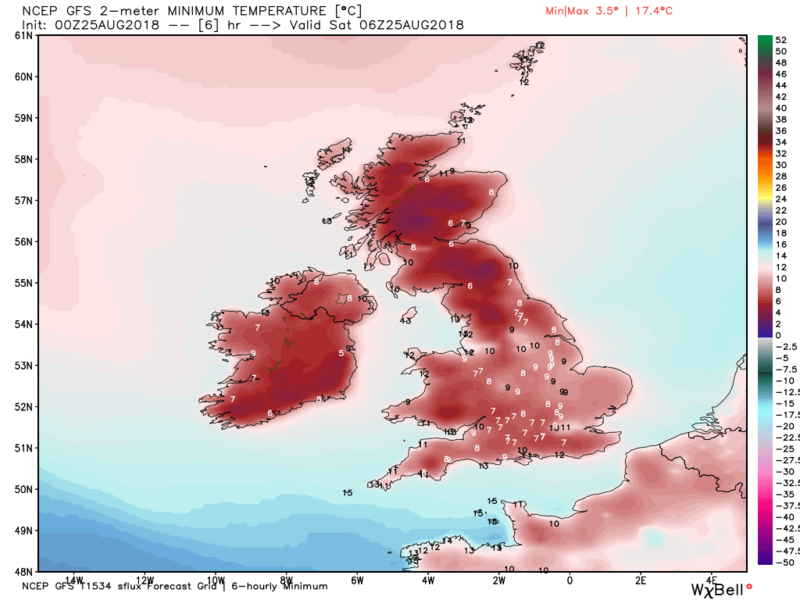 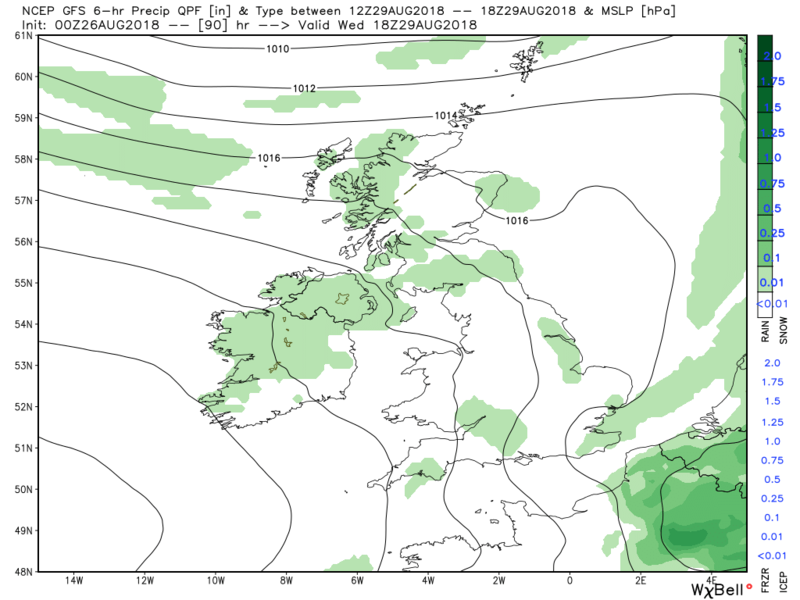 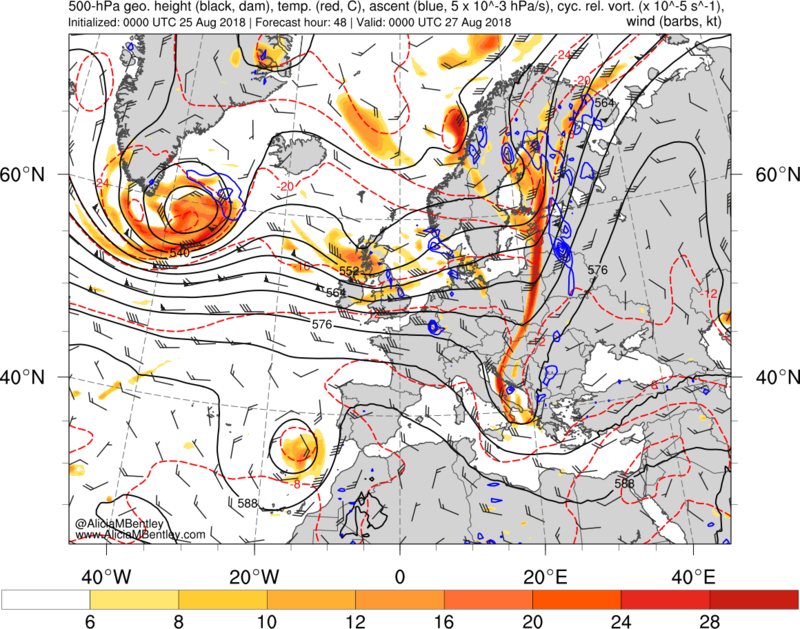 During Wednesday the cold front will track south east down the country along with some patchy rain whilst some thundery activity associated with the low over France will move north east and maybe give the south east a glancing blow. 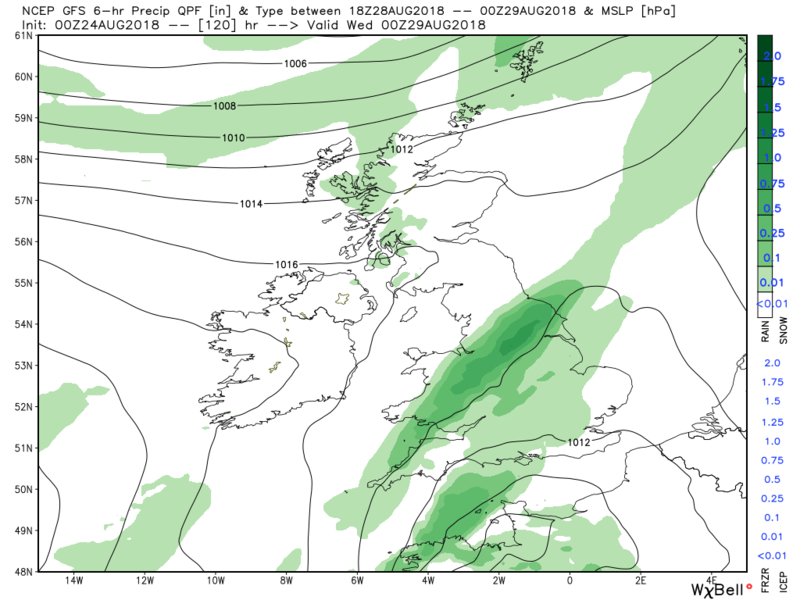 With all the fronts out of the way and a ridge building Thursday portends to be a largely fine and pleasant day, albeit the temps no great shakes. 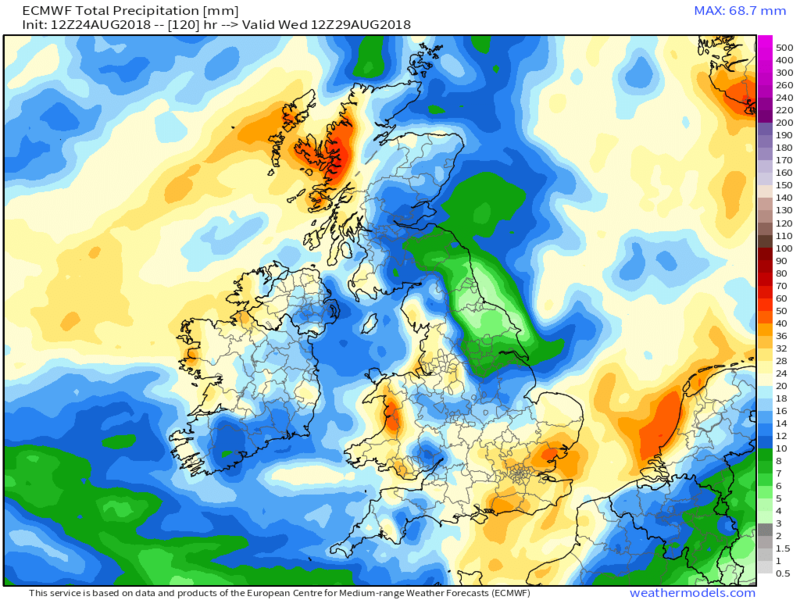 Seems optimistic to me but if the country is this dry for the entire day this would have to make 2018 a contender for the best set of Spring and Summer bank holidays on record, surely? 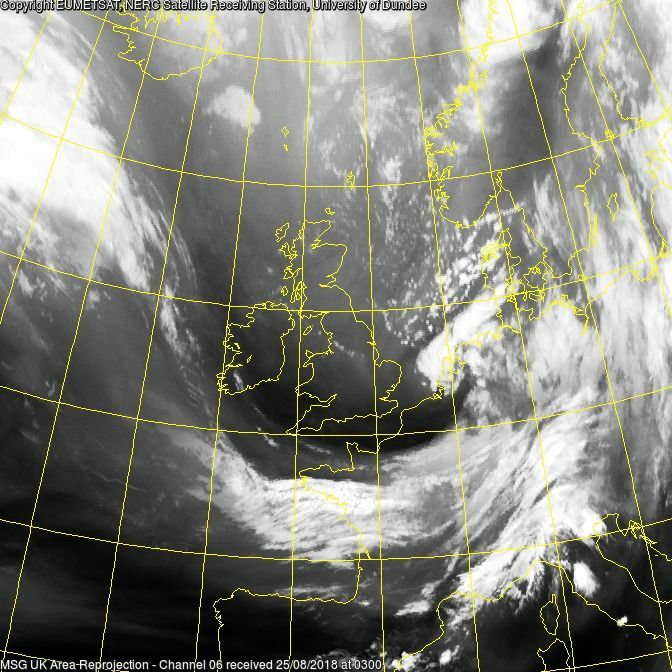 The 1800 sat image. 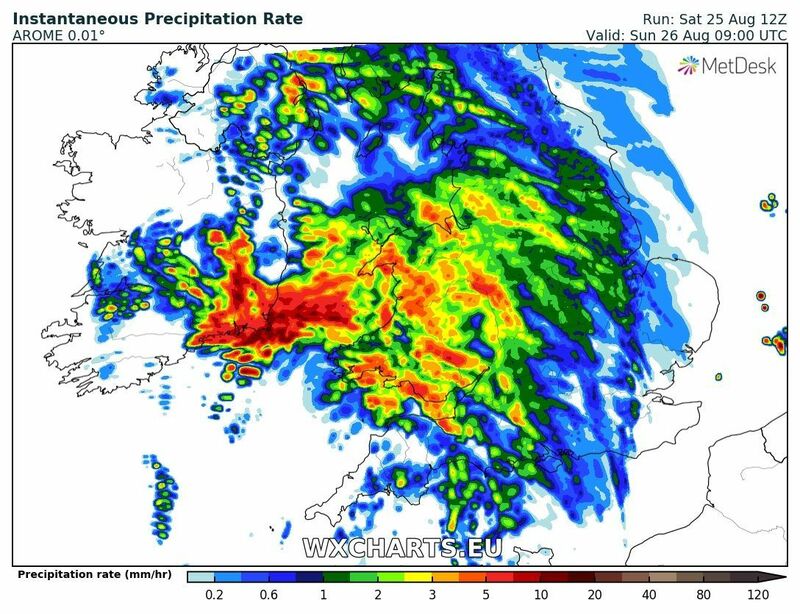 The clearance was not until late afternoon down here and I've just spent a very wet day at the South Devon Railway. 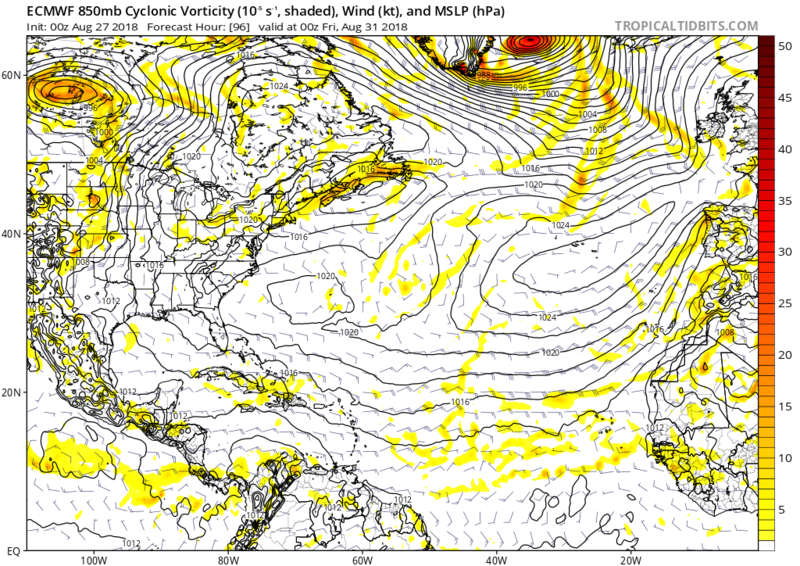 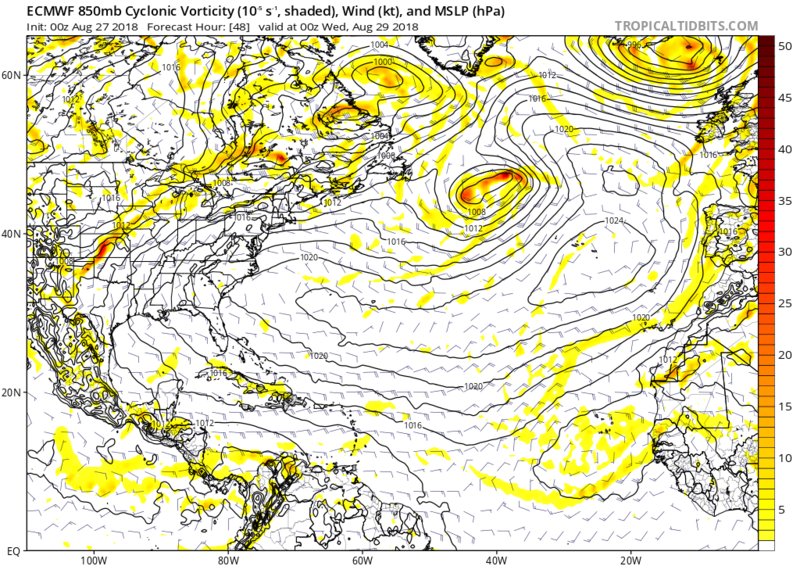 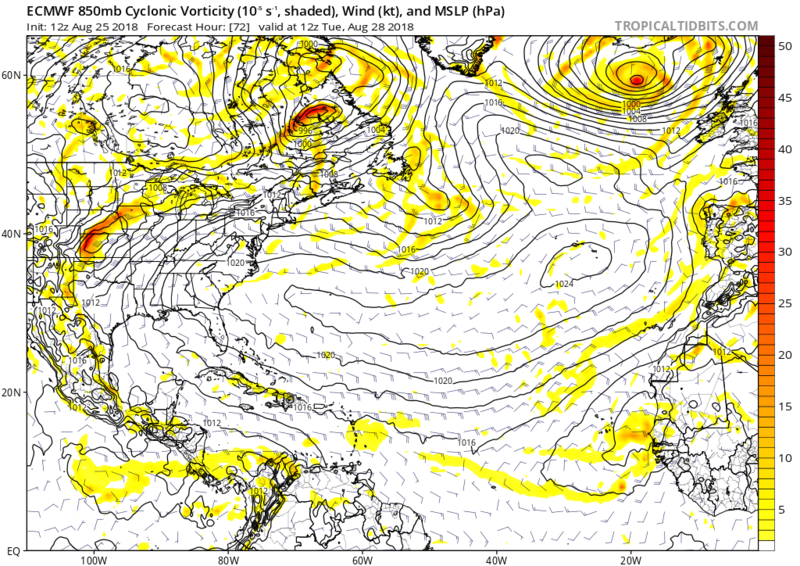 Over the next 48 hours as the upper trough moves east the Azores HP ridges strongly north east but there is still a lot of energy exiting NE North America and it soon comes under pressure. 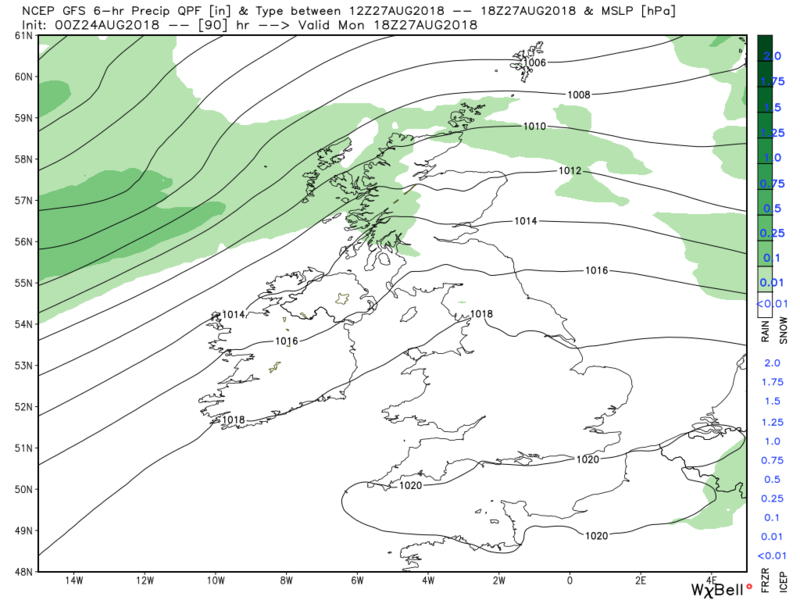 but this will soon give way to high pressure ridging north east and thus a much drier and less windy day on the cards compared to yesterday. 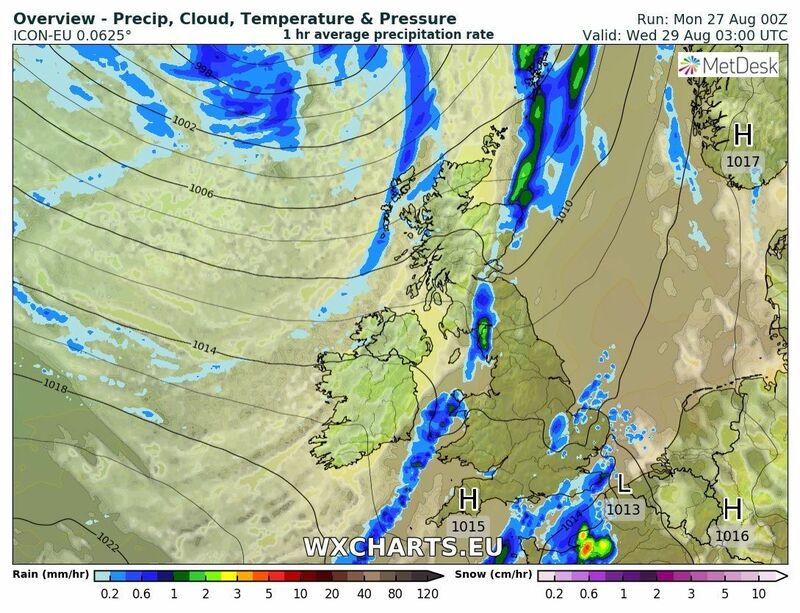 Still some showers in the north and west courtesy of the occlusion as the low moves east.but elsewhere cloudy with sunny intervals and not unpleasant in the sunshine. 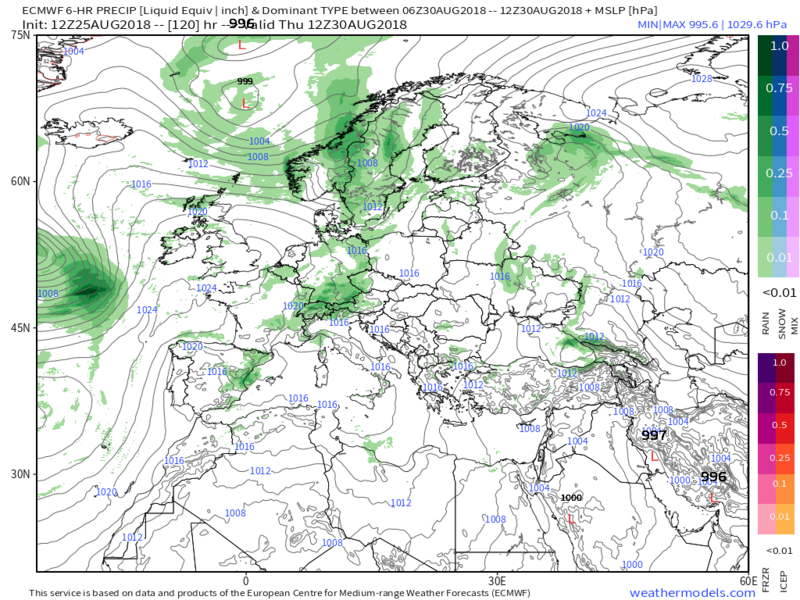 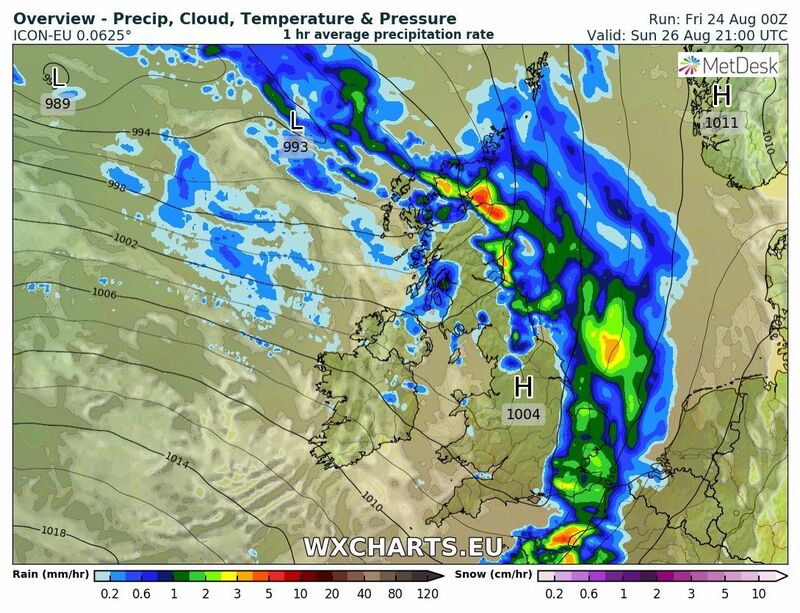 Any showers will quickly die out overnight and after a chilly start Tuesday will be clear and sunny just about everywhere but during the afternoon cloud and rain will effect the north west thanks to a cold front associated with a new low that has tracked east south of Iceland. 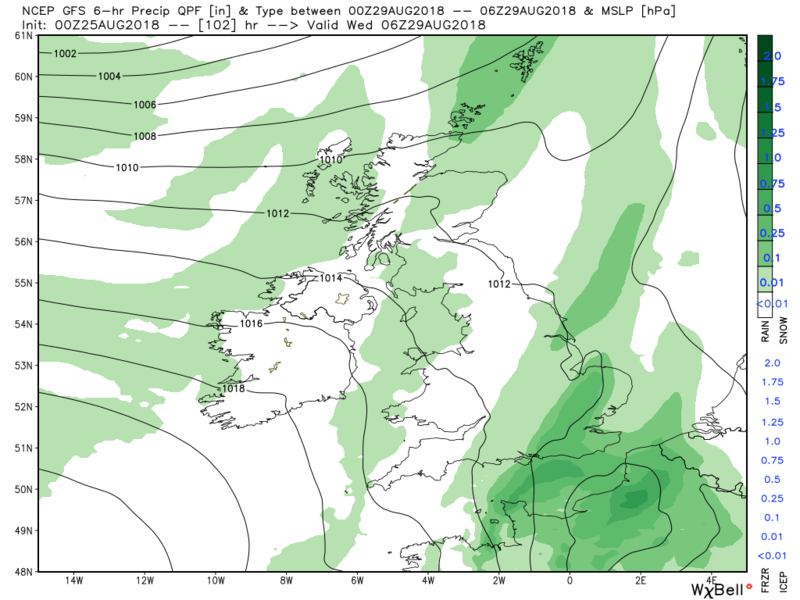 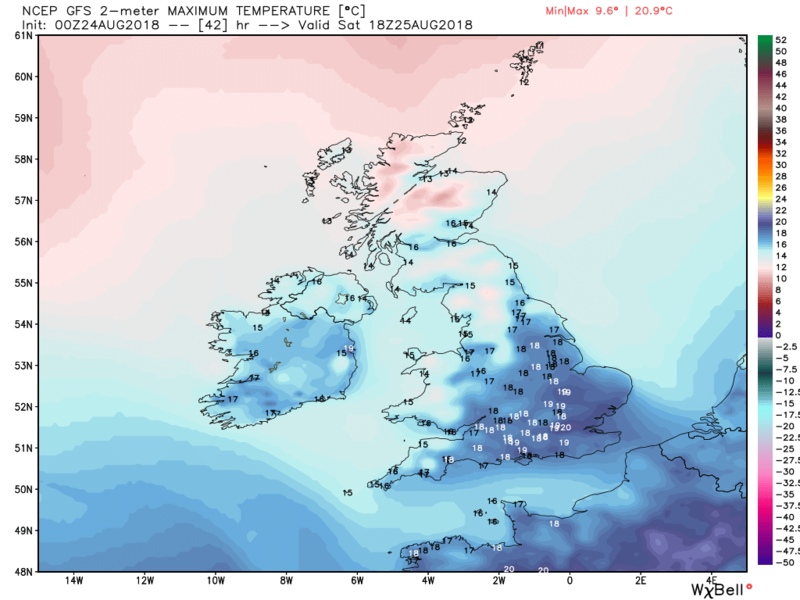 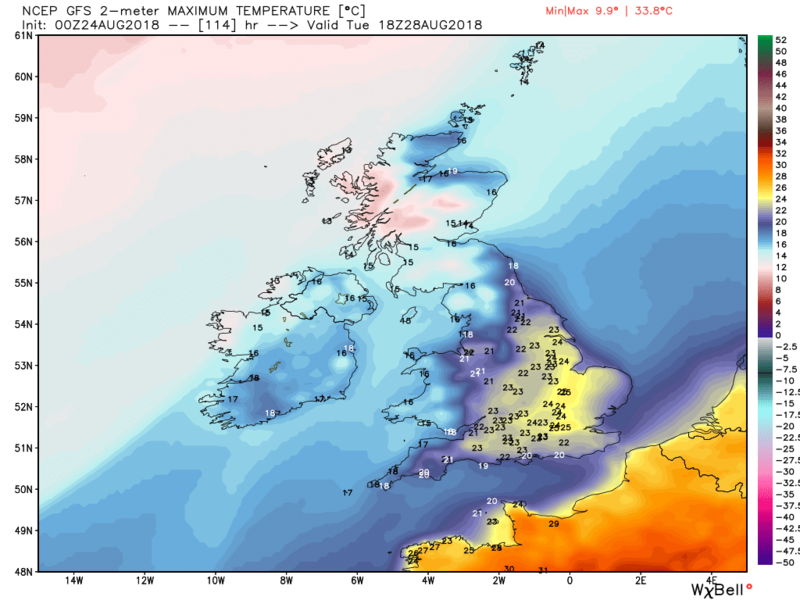 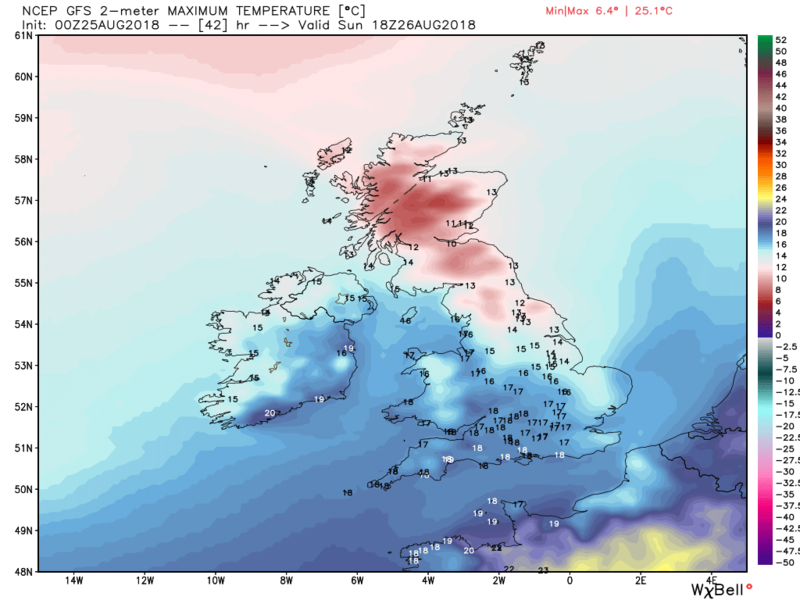 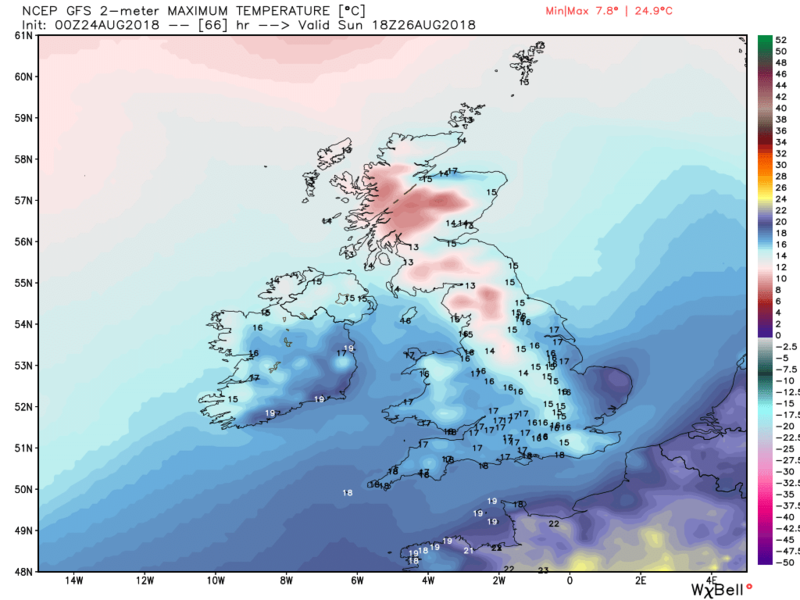 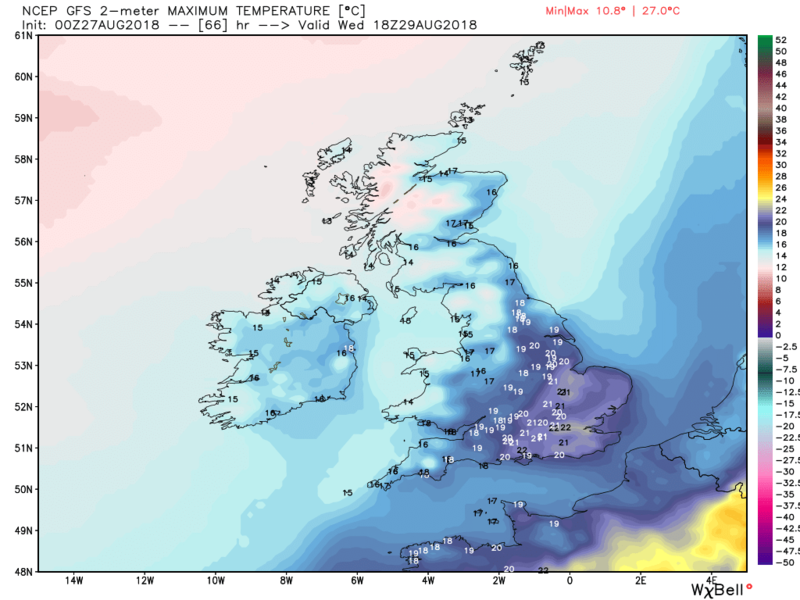 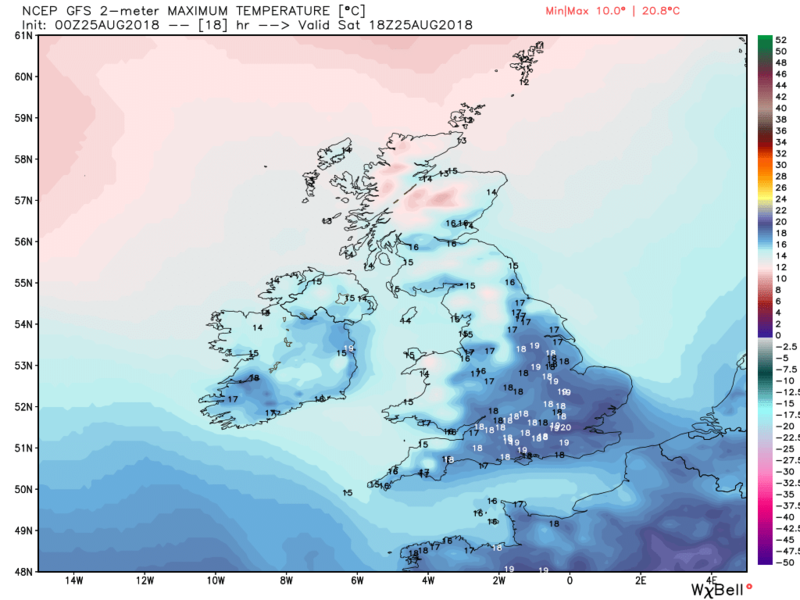 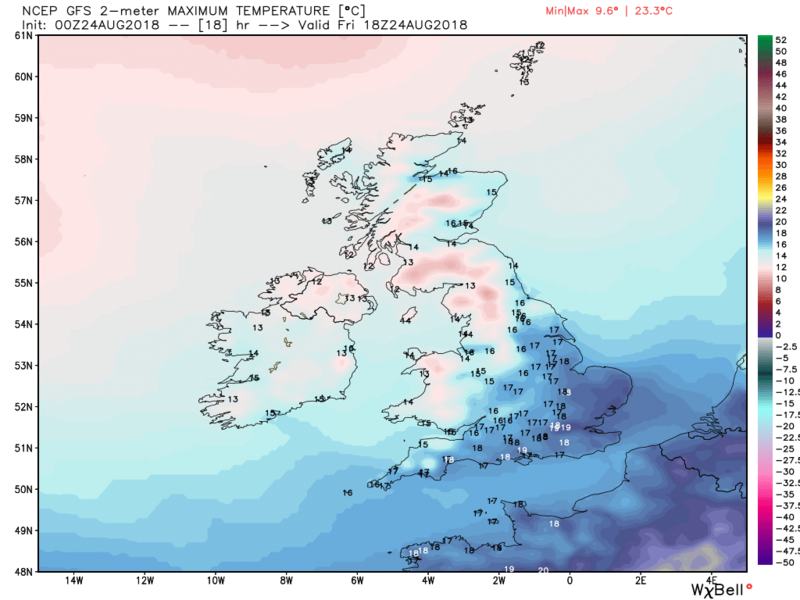 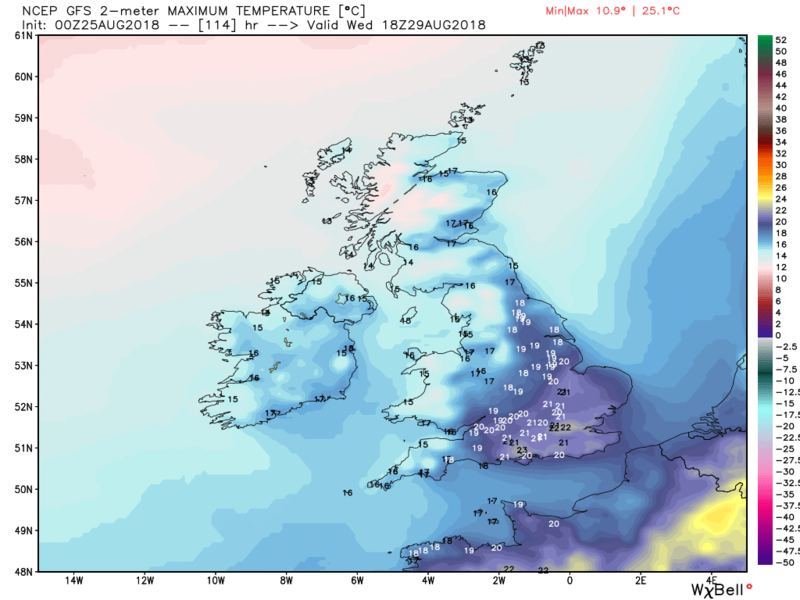 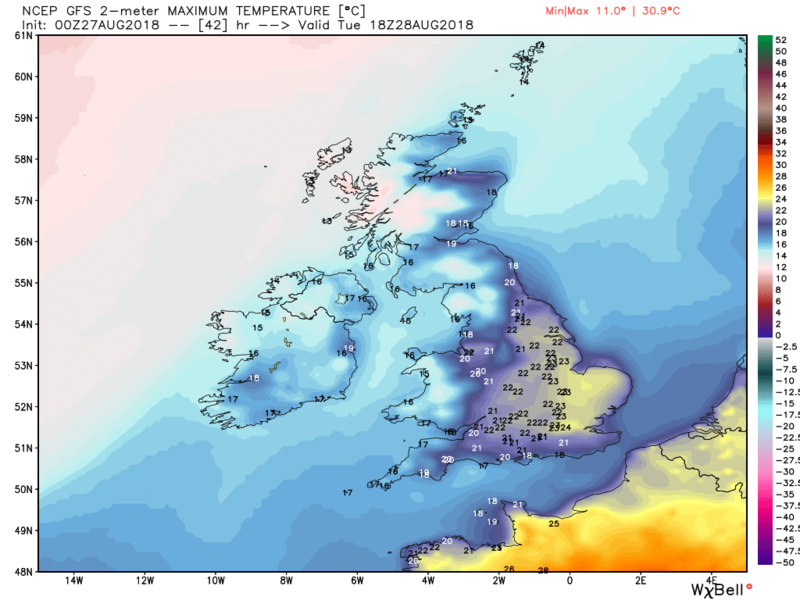 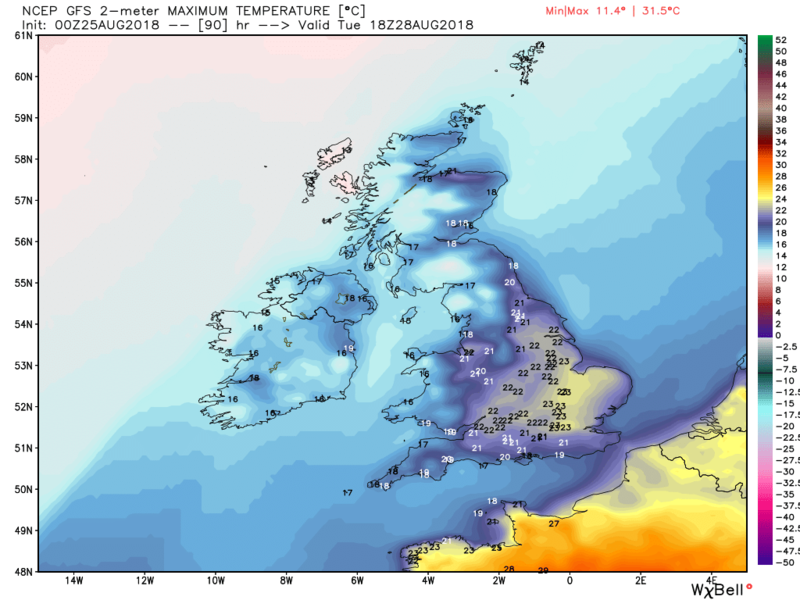 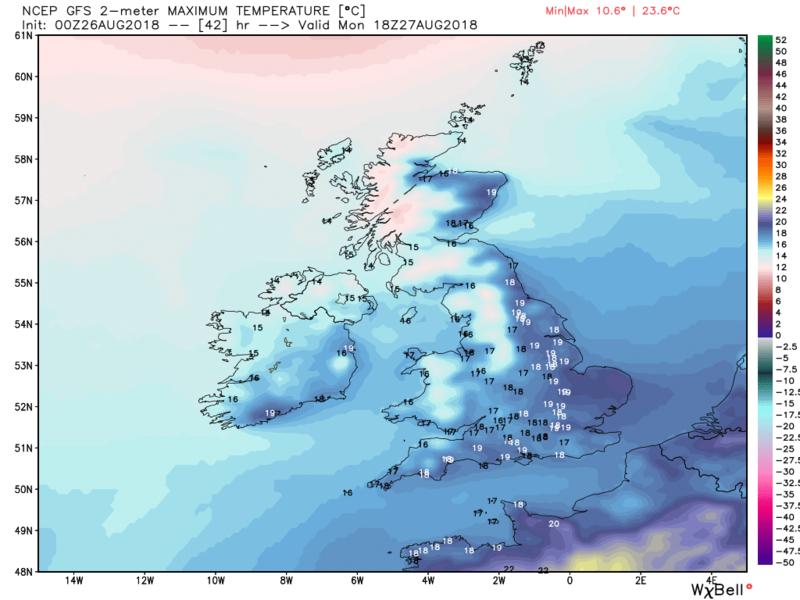 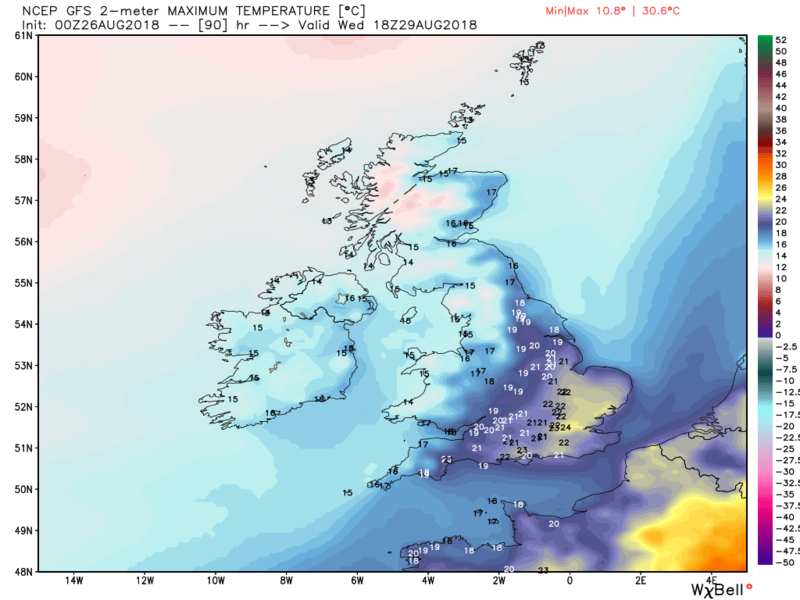 so essentially over Thursday and Friday high pressure will be in charge with light winds and mainly sunny but also with all the ingredients for some diurnal spread and some chilly nights. 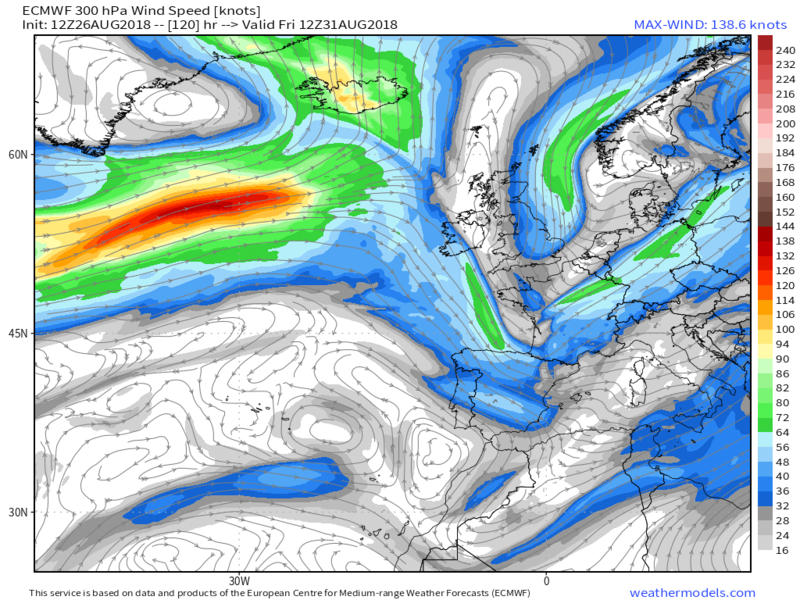 The ecm has the low that is forming around now off the north east coast of North America making inroads into the ridge as the jet splits over the western atlantic.